First things first. A huge thanks to the people who helped make this happen. Thank you Gordo from JZXproject.com for shipping me a huge stack of differential shims so I didn't have to purchase every single one from Toyota. This saved me both time and money. Thank you Boston Mike for helping make my aluminum carrier bushings. This isn't documented in this DIY but it was something I did while the carrier was out and without him taking time out of his day to make these for me, I would have had an even longer down time. And the final and most grateful thank you goes out to my brother @Rue. Without his guidance and resources, this would have been very difficult to say the least. His know how is what made this DIY possible. 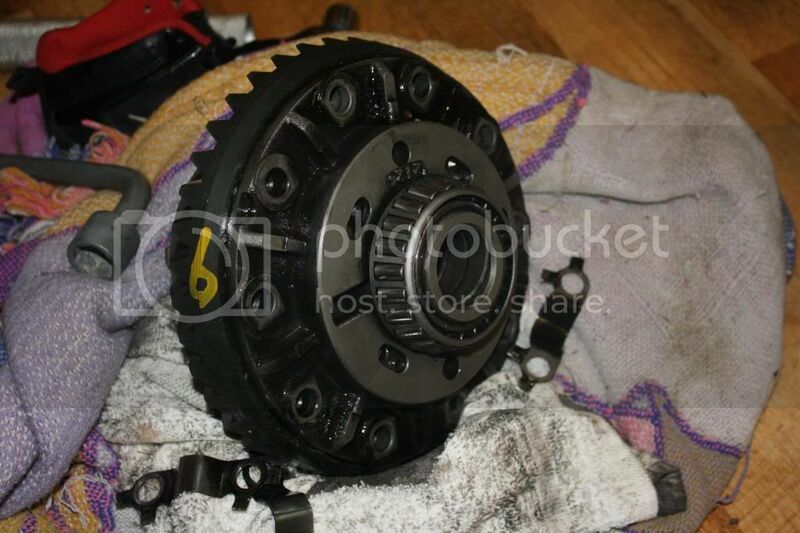 I'm working on replacing the ring and pinion, going from a 4.10 to a 4.56 final drive, and installing a new differential. I haven't seen a write up for how to do this so I may have taken extra steps or didn't do it as someone else would have. I am also tackling this as someone who has never done it before. I have had a bit of guidance from my brother over the phone but a good portion of this is based off my judgement with a simple set of hand tools in a gravel driveway. I will take as many pics as I can and will try to be as detailed as possible. This is not for the feint of heart. Proceed at your own risk. List of tools recommended . Misc. Tools: Jack, Jack Stands, Pry bar, Hammer, Flat head screw driver, 3" & 6" extentions, Sharpie, Patience, The ablility to improvise when needed. I raised the back end of the car where I had decent access underneath. My jack stands were in use so I set the wheels on blocks. Not ideal I know but I make do with what I have. Start by draining the fluid from the rear end. It is a 10mm. I did not have the right size allen wrench so I had gear oil drain a bit while removing but was able to catch the most of it afterwards. But it is a better idea to drain it first. 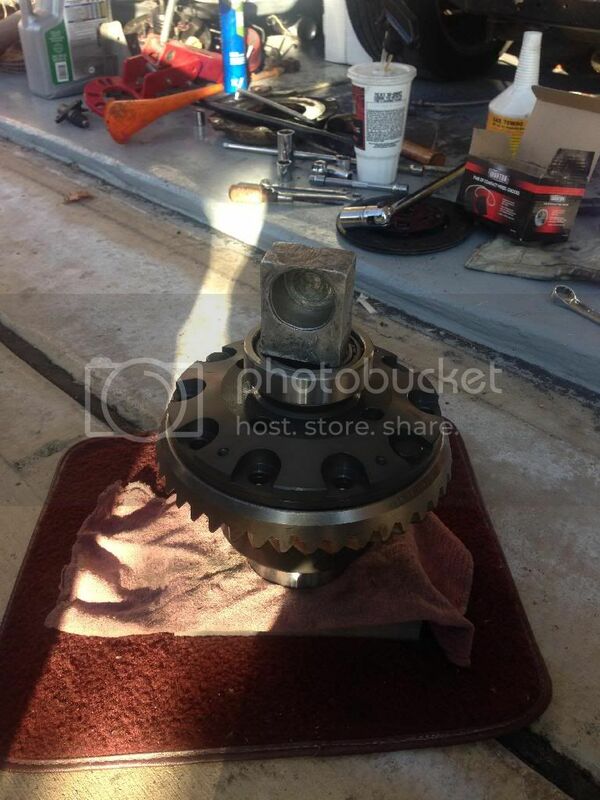 Then unbolt the drive shaft. 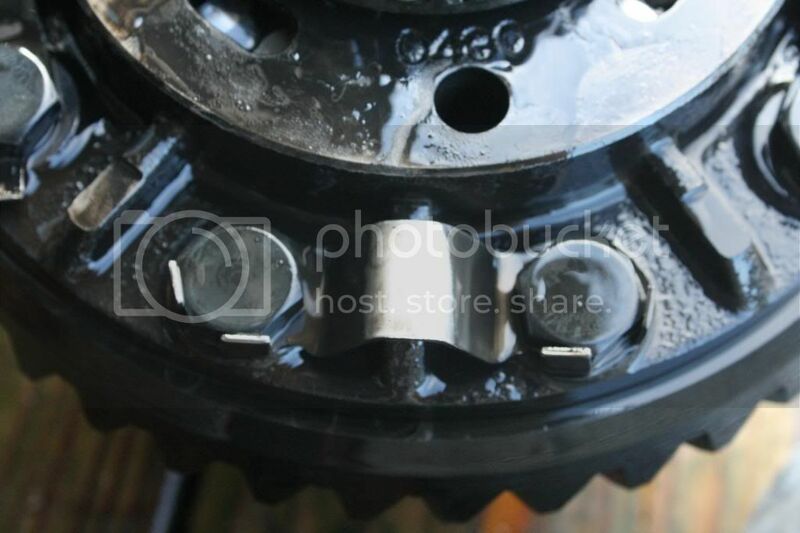 There are four 14mm bolts with a 14mm nut on each end. They are difficult to break loose but again, done with hand tools. 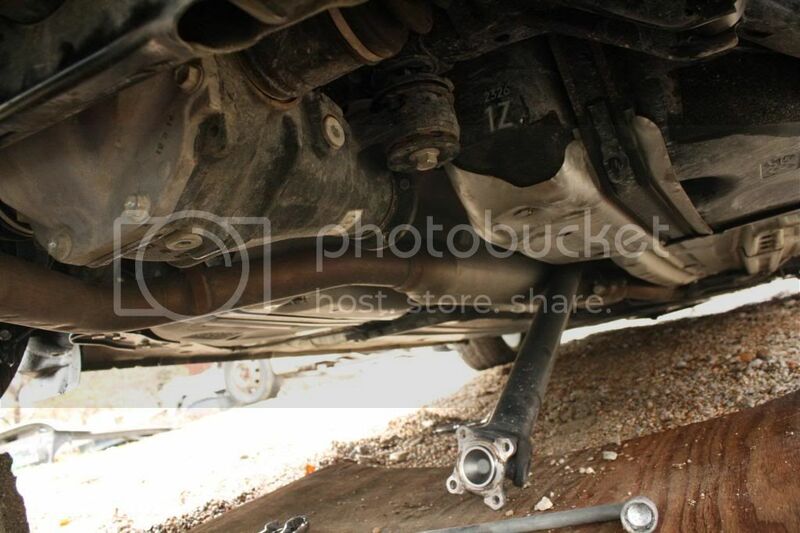 Then I unbolted the bracket that holds the driveshaft up about halfway up the driveshaft. Not sure if this had to be done but I thought it would help maneuver the driveshaft a bit easier. These are two 14mm bolts, one on each side, that are easy to remove. 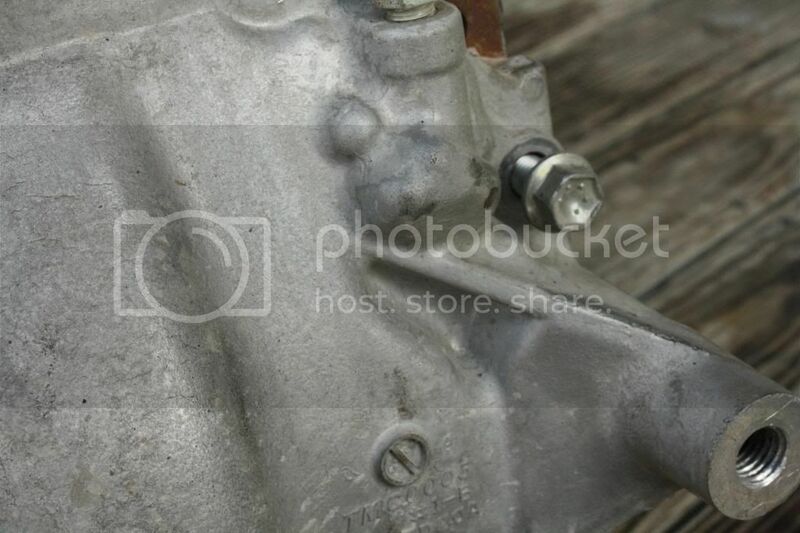 Then I loosened these three 17mm bolts that hold to the diff cover. Notice I said loosened, not removed. 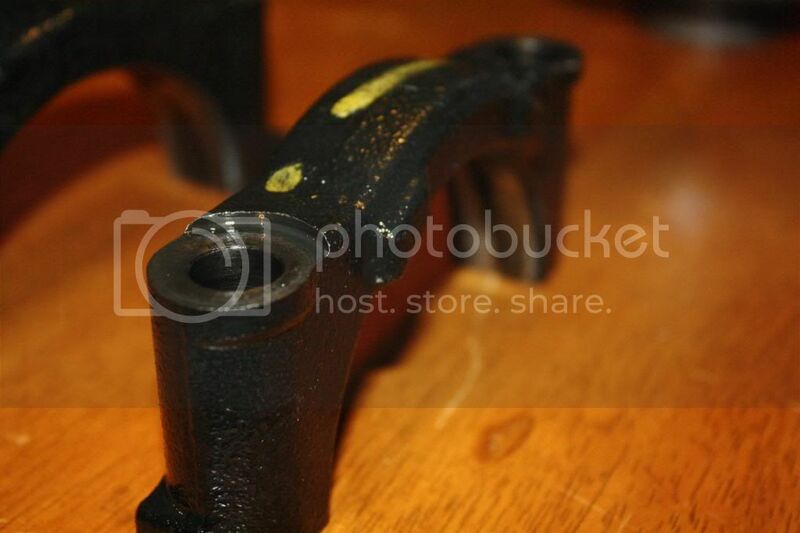 Then I loosened these two 19mm bolts, one on each side, that bolt the 3rd member to the frame of the car. Again, loosened, not removed. Then I used a floor jack to support the 3rd member and removed one of the 19mm bolts that bolt the 3rd member to the frame and two of the 17mm bolts that attach to the differential cover. 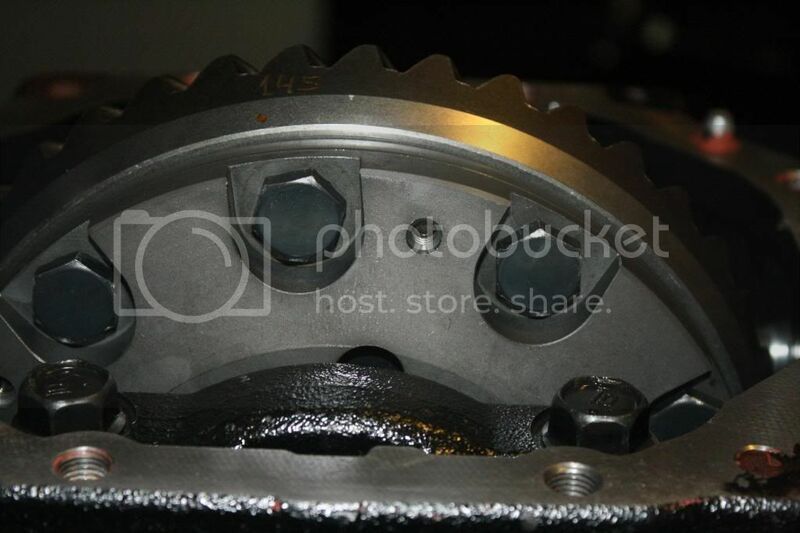 That leaves one bolt in the 3rd member and one in the differential cover held in by a few threads. This keeps the 3rd member in place but does allow some movement. Then using a pry bar I popped the axels out. Prepare for a bit of a struggle and a few curse words to be thrown out because this was difficult. 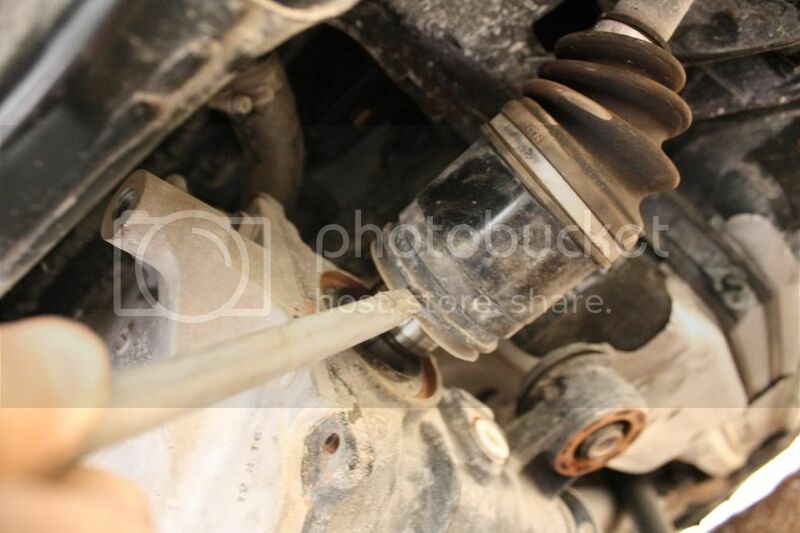 Keep in mind I'm doing all this while not unbolting anything on the rear suspension so axle movement was limited. However with a little patience they do pop out. Not here. 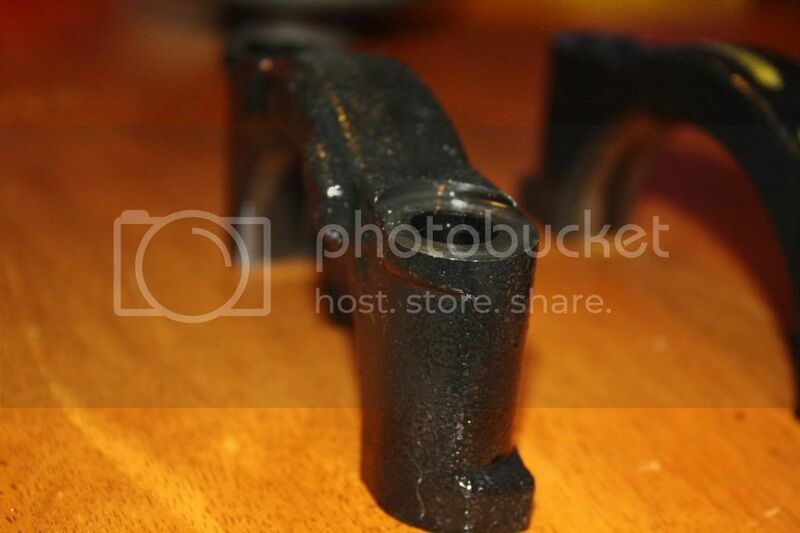 This is a thin piece that will bend and not give any support to pry on. 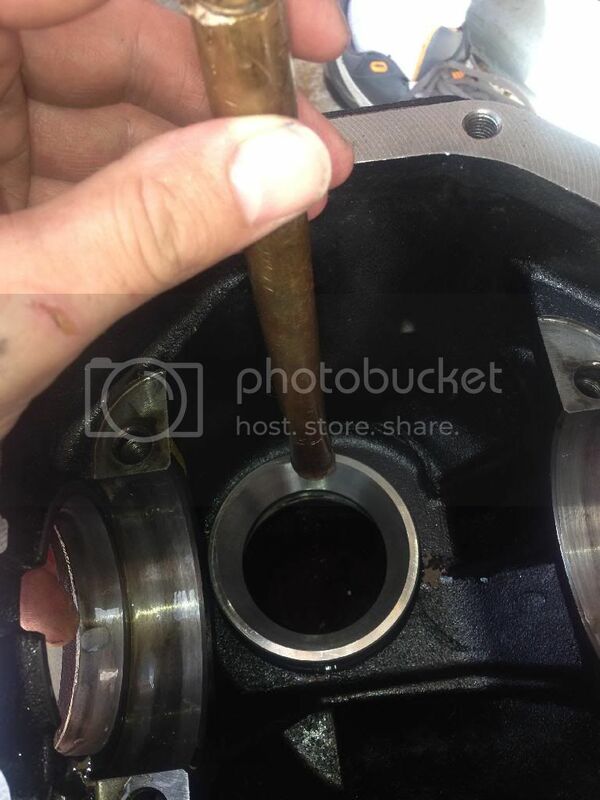 After that remove the last 19mm bolt and 17mm bolt that is holding the 3rd member. With a little wiggling it will come down. 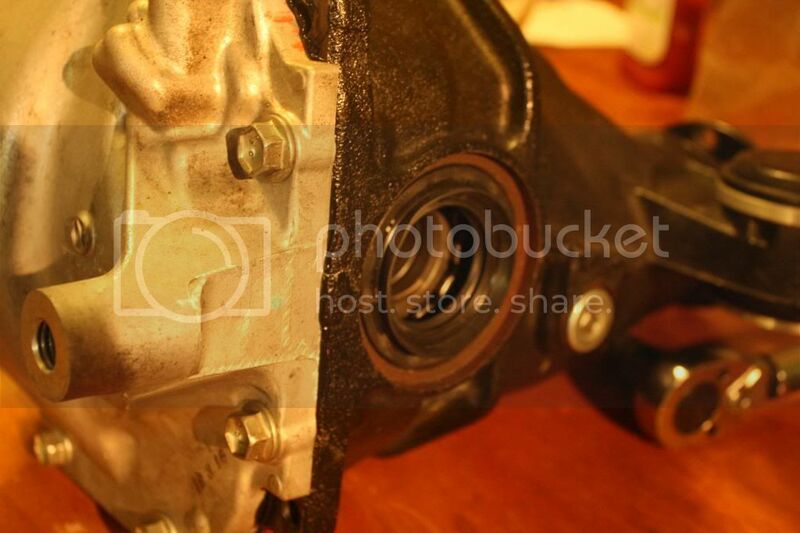 Next I removed these eight 14mm bolts that hold the differential cover on. 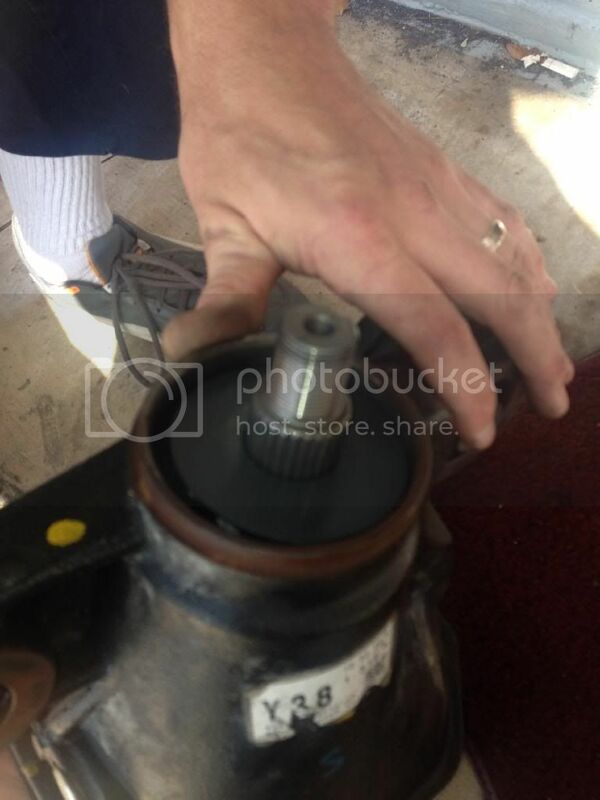 Using a rubber mallet, I tapped where I could to unseal the diff cover. 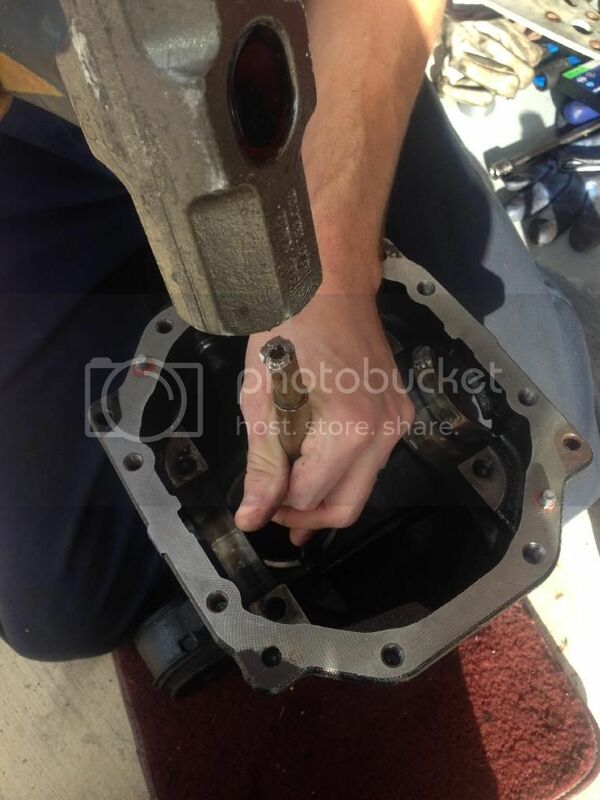 I then removed these four 17mm bolts that hold the caps on that keep the differential in place. 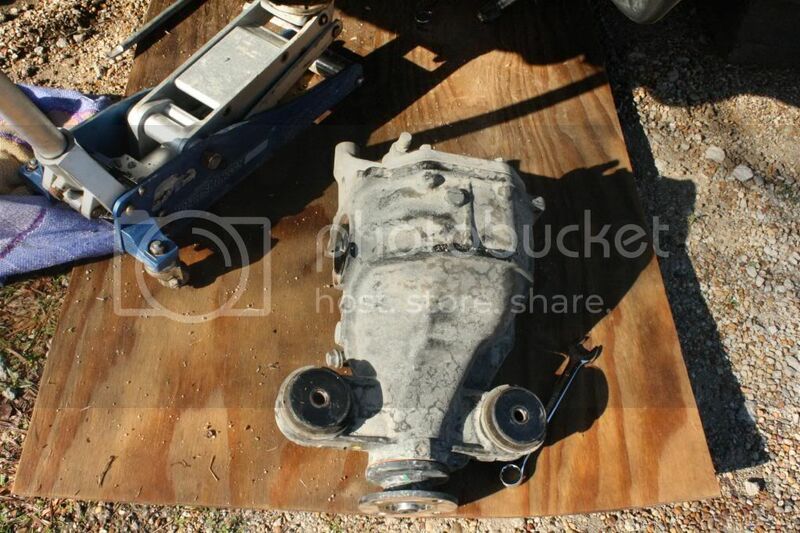 Anyone planning on doing anything with removing the differential should take a picture at this point. I have been told it is important when reinstalling to make sure the caps go back in their original location. Do not mix them up. The cap on the right of mine was marked so I could only assume that Toyota marked everyone's, but if not, mark one of them. I then inserted a flat head screw driver into the hole of the cap and with a small bit of prying, the caps popped right off. 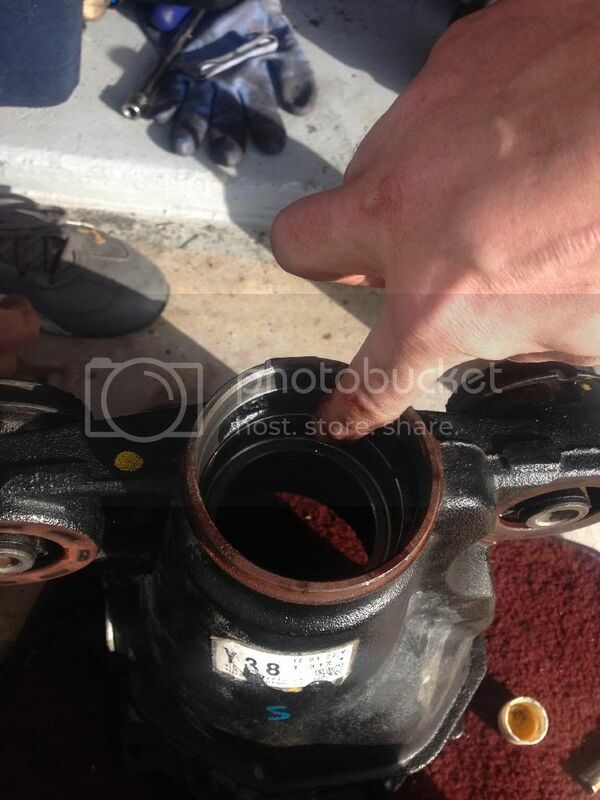 After this, with a little work, the differential will come right out. Notice the one that is marked has a dot at the bottom so I know which is up and which is down. But even without that you would be able to tell which side goes to the top and which side goes to the bottom. Each cap has two "ears" on the outer sides. 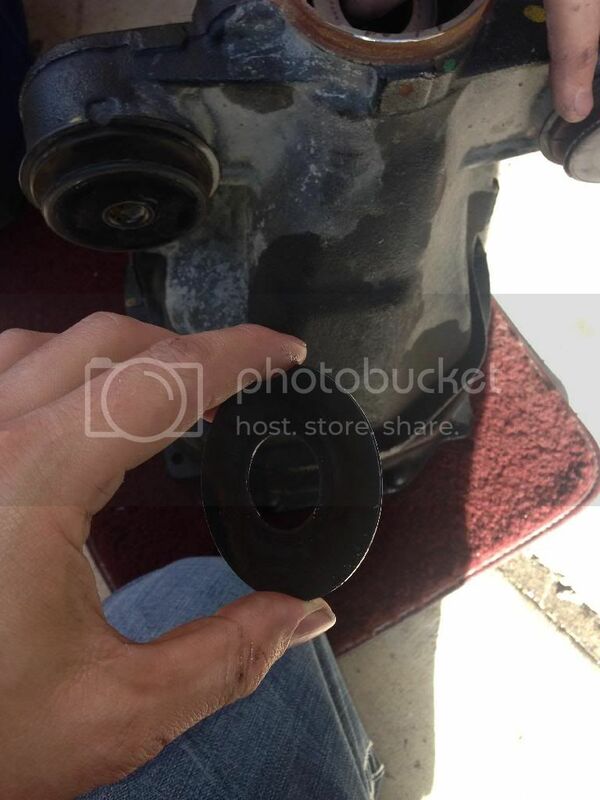 So just make sure when installing that after you determine which is the right side and which is the left side that the "ears" are pointing outwards towards the casing and not inwards towards the ring gear. 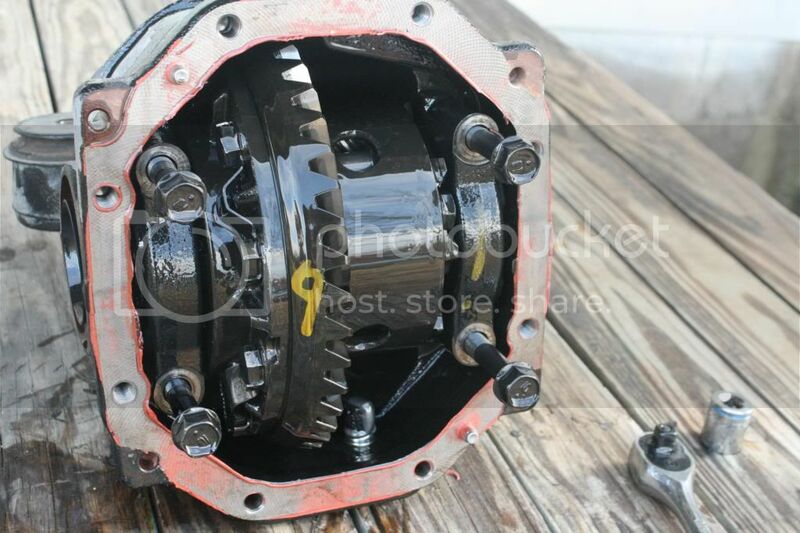 I'm using a new differential and installing a new ring and pinion but I need the bolts that hold the ring gear to the diff. There are brackets with tabs that keep the bolts from backing out. Using a flat head screw driver and a hammer, I tapped on the tabs until they flattened down. That pretty much gets me to a stopping point. 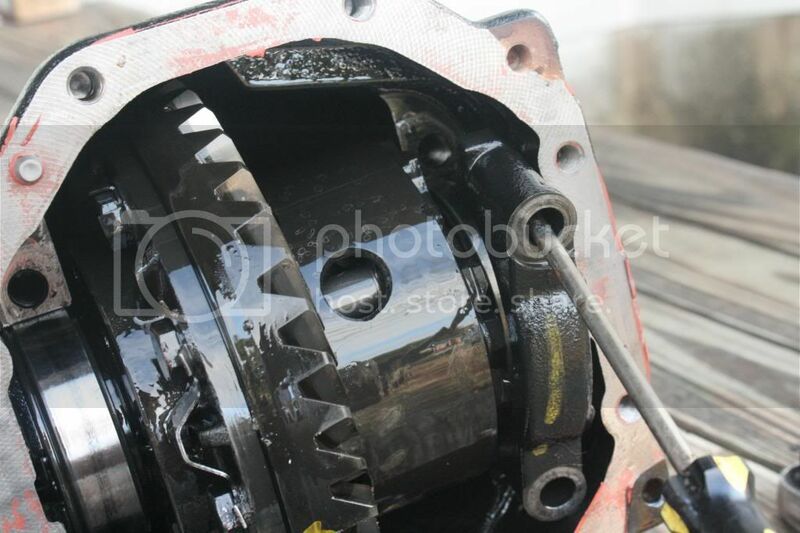 I need an impact to get the bolts off that hold the ring gear on. I'll update as I move further along. 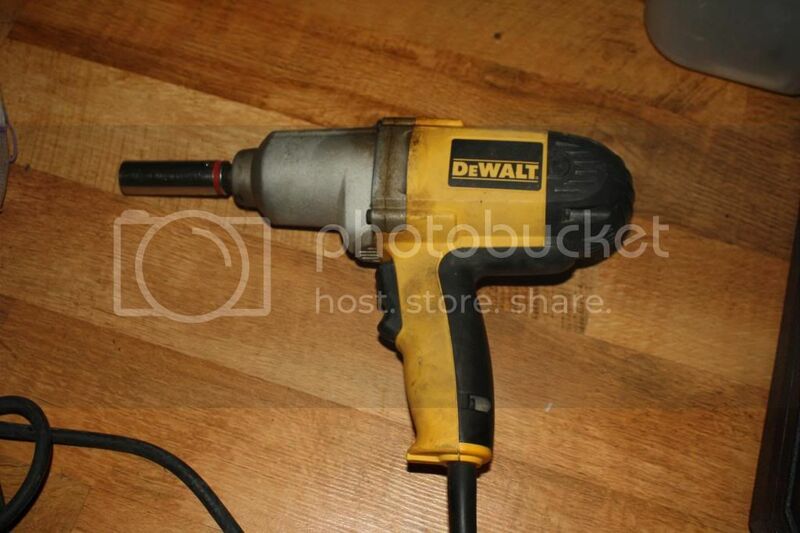 Found a 17mm with a 1/2" drive so I broke out my corded DeWalt drill. Me 10 - bolts 0. I've had my Tomei diff in the freezer for the past couple of days. The diff shrinks a bit when doing this. Made it easy as could be to slide the ring gear on. I had to be quick though to get a couple of bolts in place. And by quick I mean within maybe 2-3 minutes. An extra set of hands would've been useful. 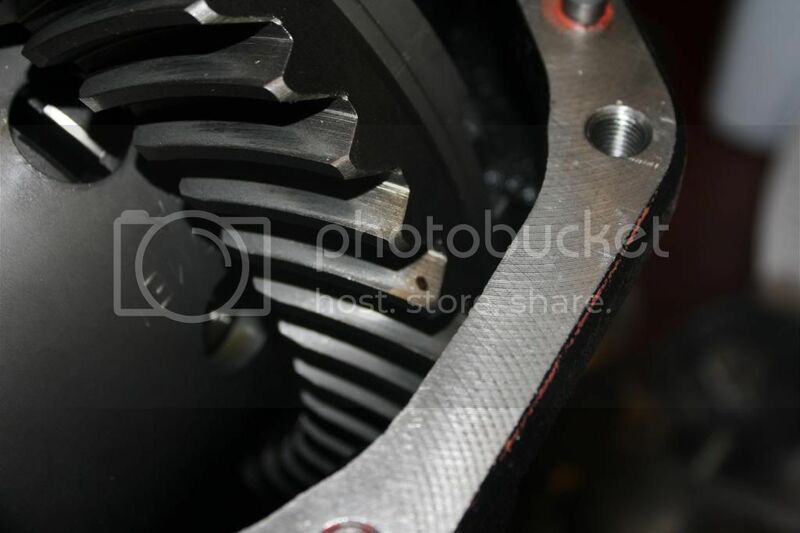 The diff started warming up and expanded to where the ring gear wouldn't budge. I got two bolts in though to set the gear in place. 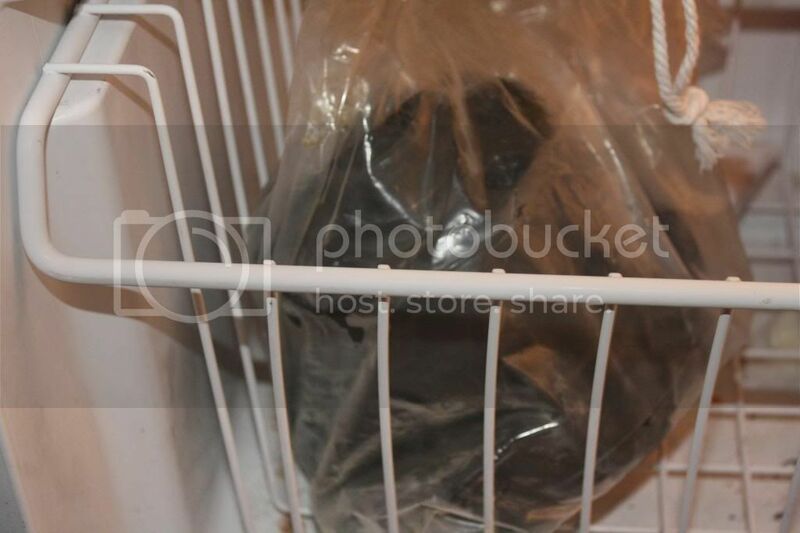 If you don't have room in the freezer, you can boil the ring gear in a pot of water. Just be careful not to burn yourself. Then put the rest of the bolts in. 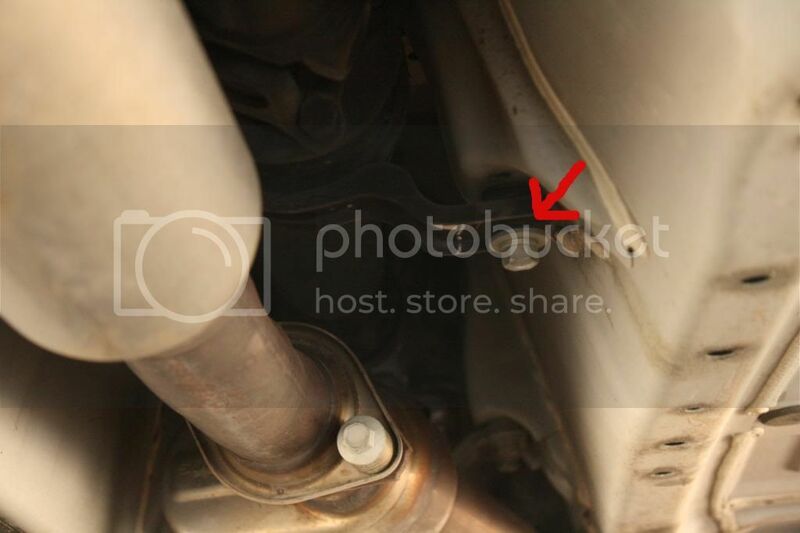 I did not reinstall the tabs that hold the bolts in place. If it makes you uncomfortable to do so, then by all means, reinstall them. I just used red locktite and torque them down to 71 ft./lbs. Started removing old bearings and installing new ones. My brother's work is closed for the holidays so I did not have access to a press. I'm a little impatient so for installing the carrier bearings, I improvised. And a BFH. I just let the weight of the hammer do all the work until it was all the way down. 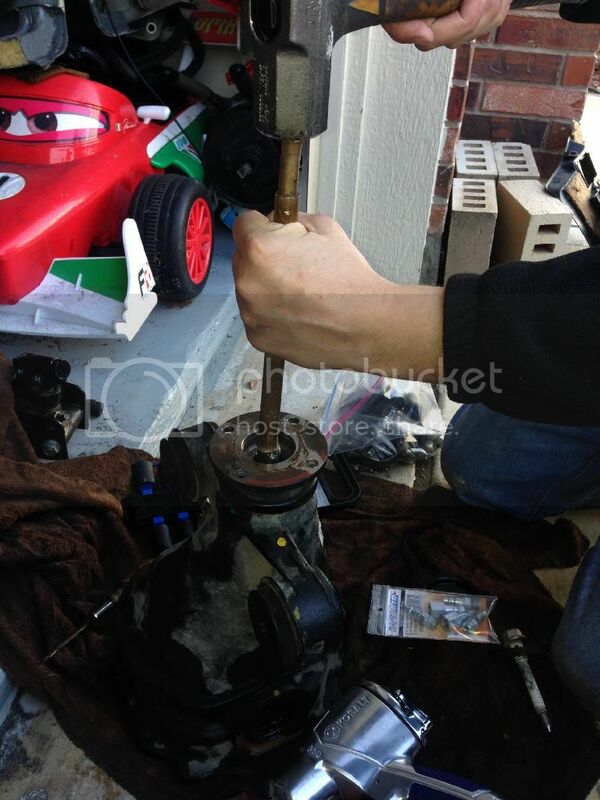 Then I removed the pinion nut with an impact. You can use a 30mm socket or a 1 3/16". 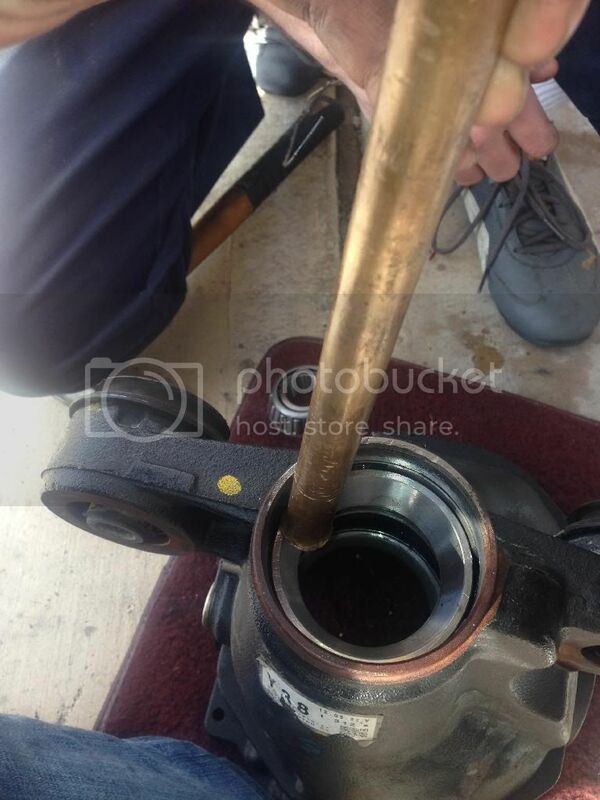 I then tapped out the pinion with a piece of brass. I've been told to always use either aluminum or brass or some sort of soft metal when doing these things. Steel on steel = bad times. 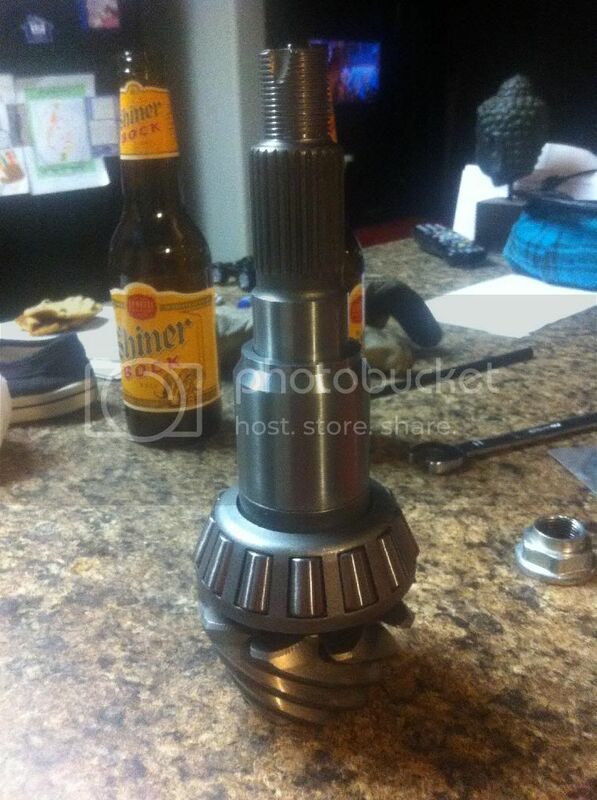 I need the factory spacer under the pinion bearing. With no access to a press, another improvising was needed. Need to get under here. Use of a cutting wheel got the top part off. Started getting through the bottom but ran out of day light. That was all I could get done tonight. I'll try to have more done on Saturday. 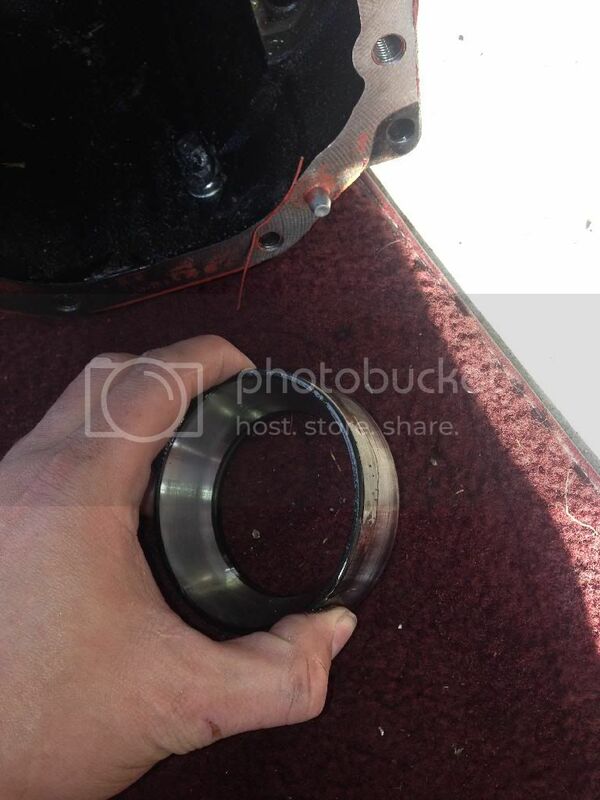 My brother was a nice guy and finished removing the rest of the bearing for me last night. 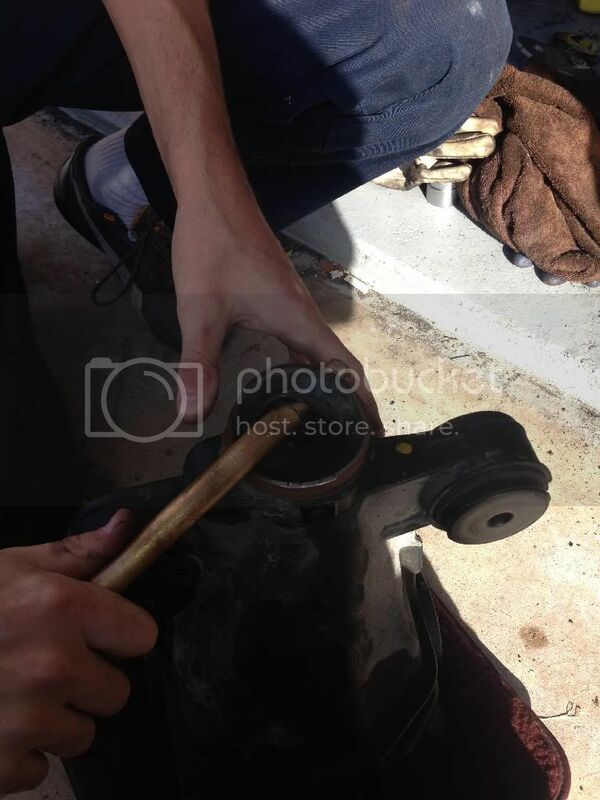 Then he installed the new pinion bearing after putting on the factory spacer. He's not as excessive as I am taking pictures of everything so I'll have to ask him how he did it without a press. 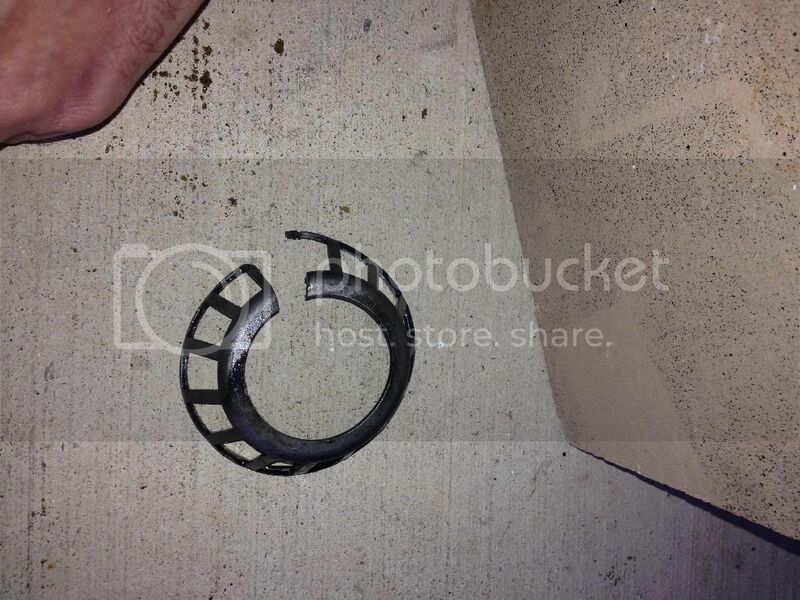 If I had to wager a guess I would say he used the piece of brass and a hammer and lightly tapped around the circumference of the bearing. This is risky doing this and requires patience and a steady hand. Proceed with caution or wait until you have access to a press. Then goes on the solid pinion spacer. We used this instead of the OEM crush sleeve. Now comes the hard part of setting the pinion depth and preloading the pinion bearing. 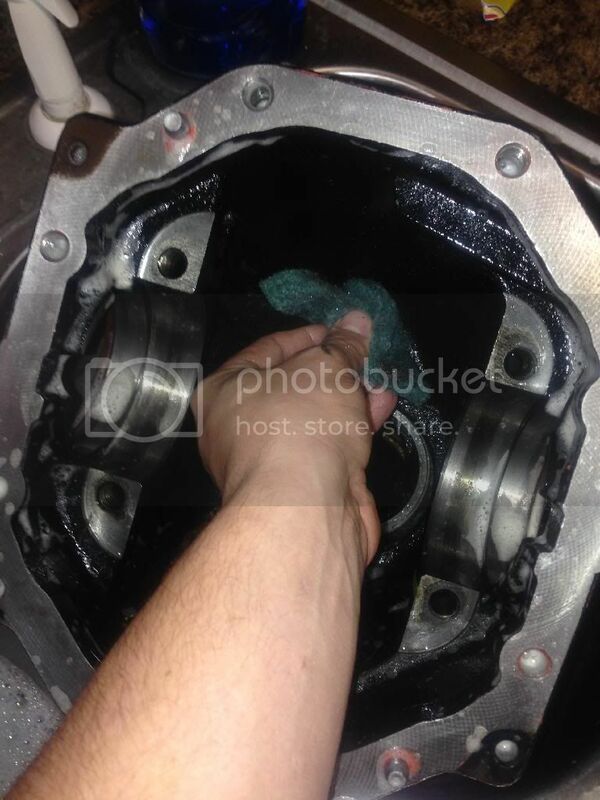 We start by removing all the old parts starting with the pinion seal. We just used the piece of brass and the BFH and hit downward on the outter edge of the pinion seal to break the seal then pull it out. 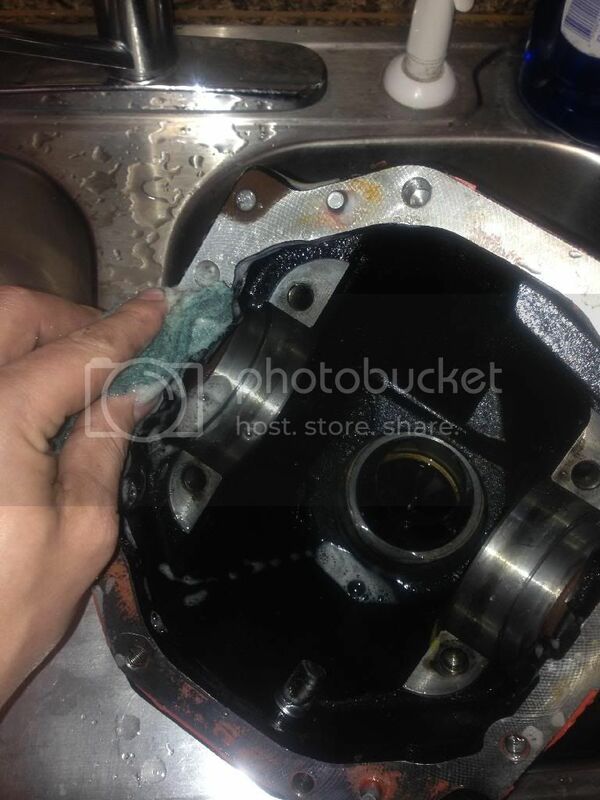 Then remove the oil slinger and the old bearing. Now remove the old races. I used the brass shaft and the BFH to knock them out hitting on opposite ends of the race until it pops out. Don't hit too hard on one side or the other as to not get it in a bind. 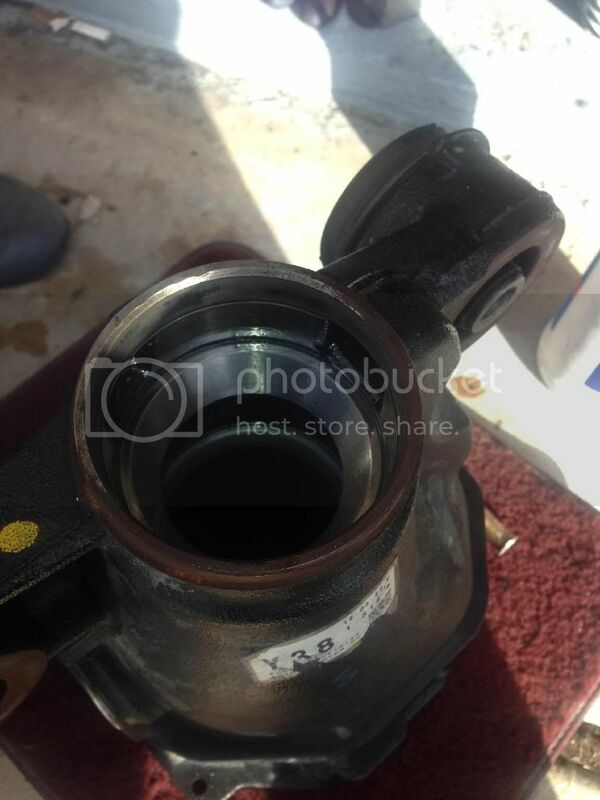 I'm replacing the axle seals as well. 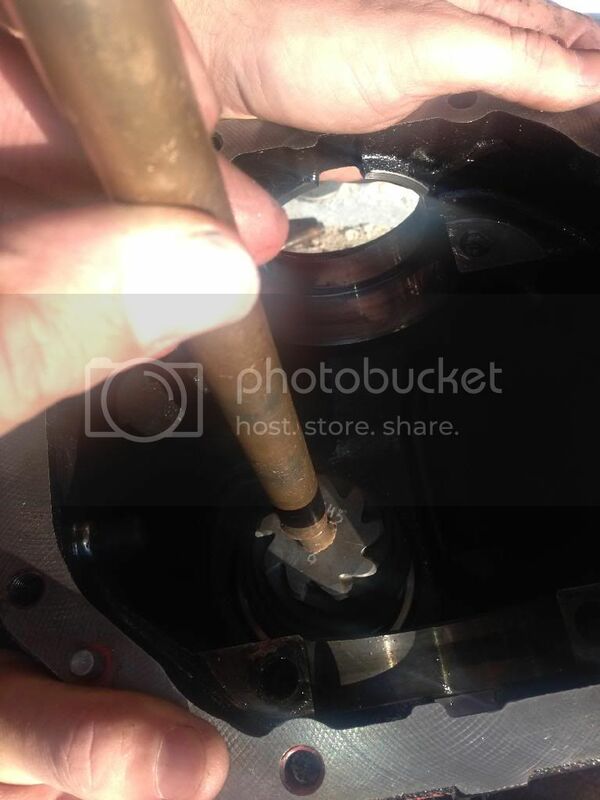 Use the same technique as when removing the pinion seal. I then proceeded to clean the 3rd member. You want it to be free of debris and contaminants before installing the new parts. I just used hot soapy water. After drying you want to be sure to lube all the machined surfaces to prevent rust. 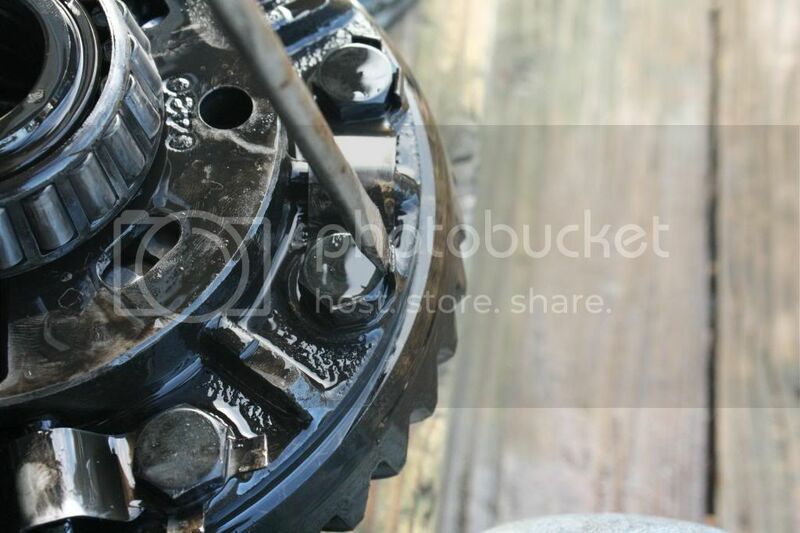 I used some spare gear oil I had. Time to install the new races. It's pretty much the opposite of removal. Just be patient when tapping them in. Don't get them in a bind and tap in different areas as needed to get them in place. 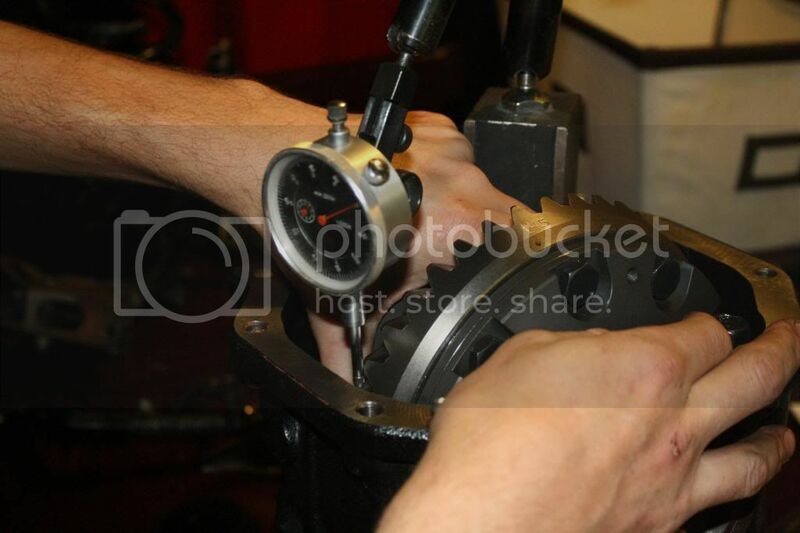 Now comes the tedious part of setting the pinion depth and preloading the bearing. 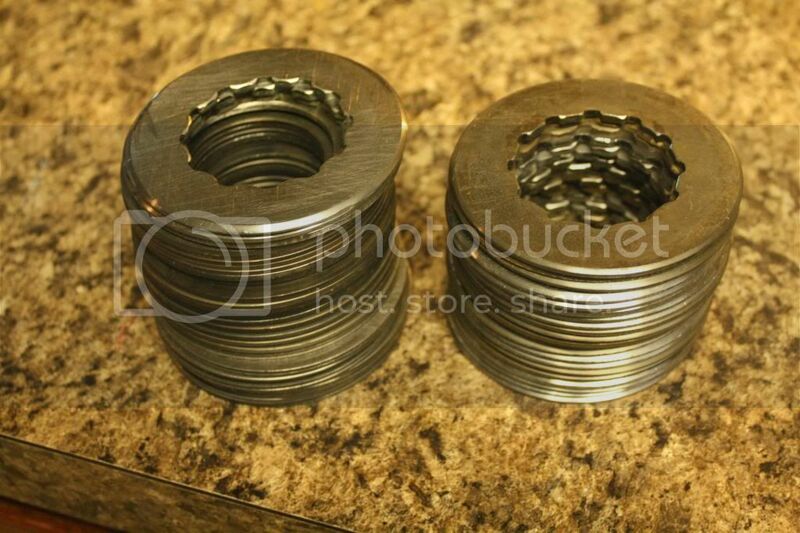 The way I'm doing this is with using the solid pinion spacer and NOT a crush sleeve. You will more than likely need another set of hands to help with this part. Stack all of the supplied shims on top of the pinion spacer. 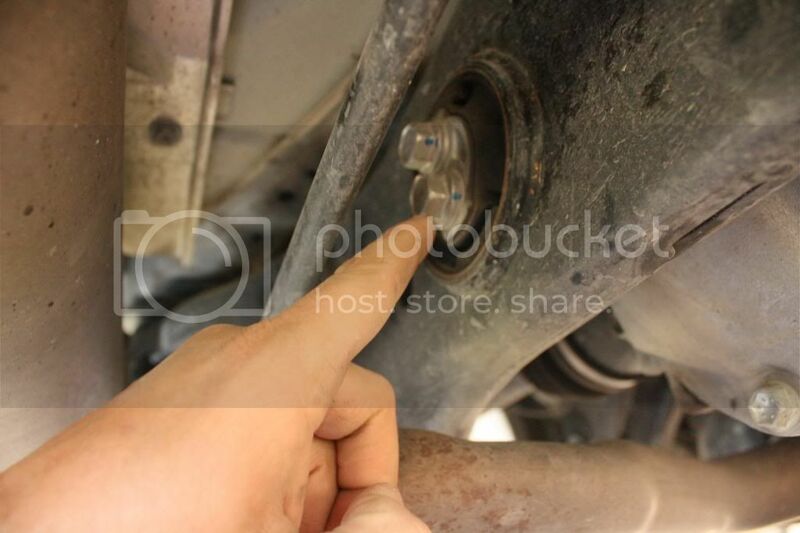 Then have someone hold the pinion in place while you put on the new bearing, oil slinger, and the part the driveshaft bolts to in place. If you can get a couple of threads started, put on the pinion nut. 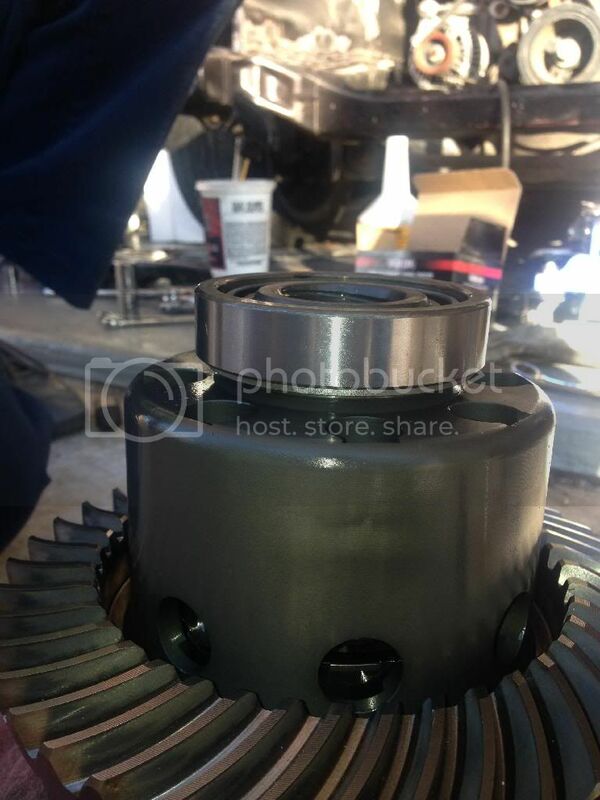 I couldn't so with everything in place we flipped 3rd member over and with the brass rod and BFH, tapped on the top of the pinion to help "press" it into the bearing. 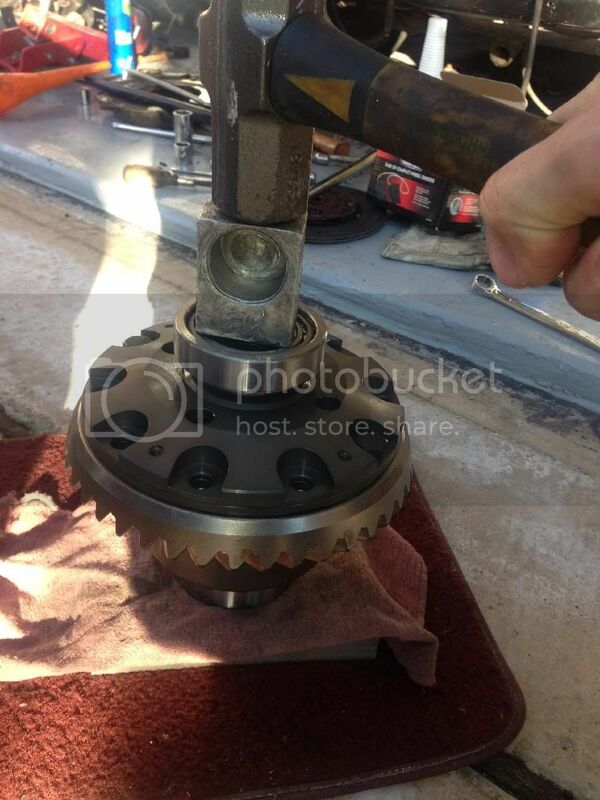 Then put the pinion nut on. 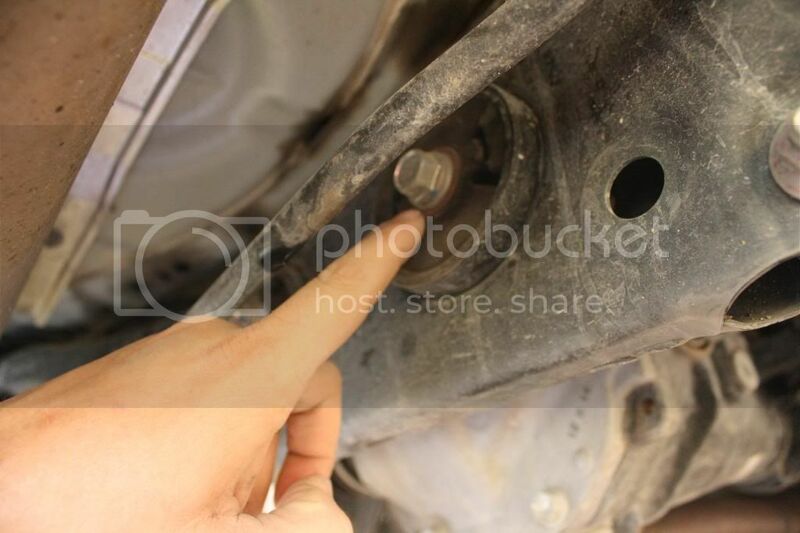 You will need to use something to keep the part that the driveshaft bolts to from spinning. This is how I did it, but you can use whatever you have available. Then using an impact, while using whatever it is you came up with to keep everything from spinning, tighten the pinion nut until it stops. Then you need to setup a dial indicator and set it to 0. 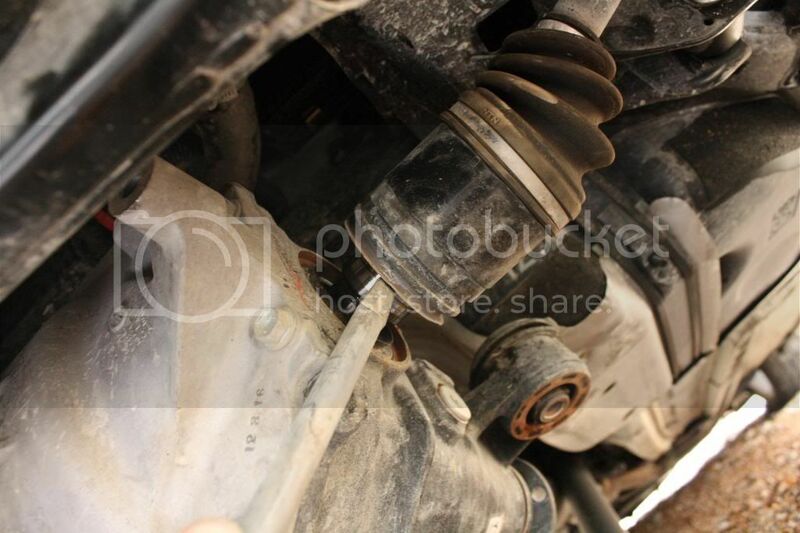 Then slowly pull up on the part the driveshaft bolts to until it stops. 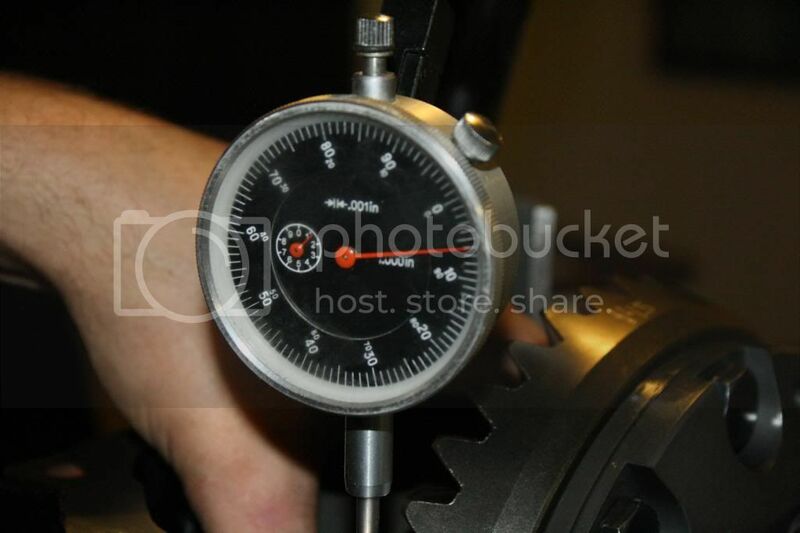 Read the dial to find out how much movement there is in the pinion. That is the amount you want to remove in shims to get the movement to 0. DO THIS IN A SERIES OF STEPS!! 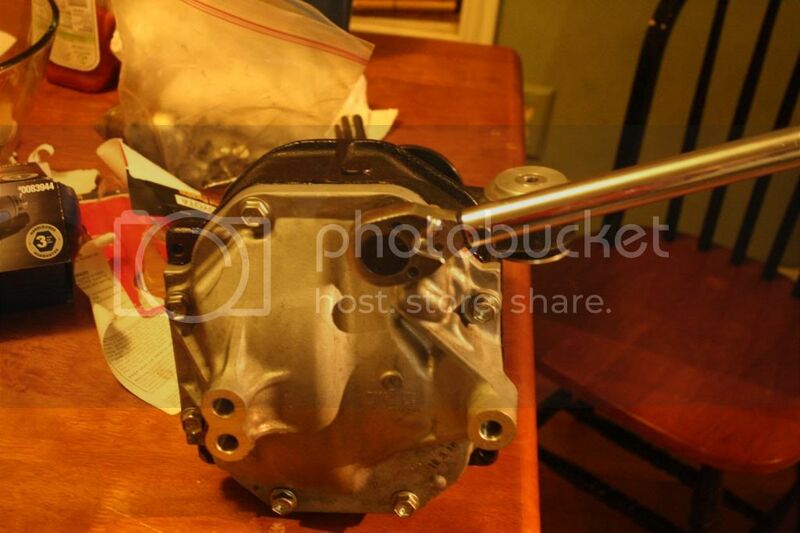 Remove a few shims, put it together, and check the movement, then repeat. If you're this far into it you've done too much work to start rushing things and this needs to be exact. 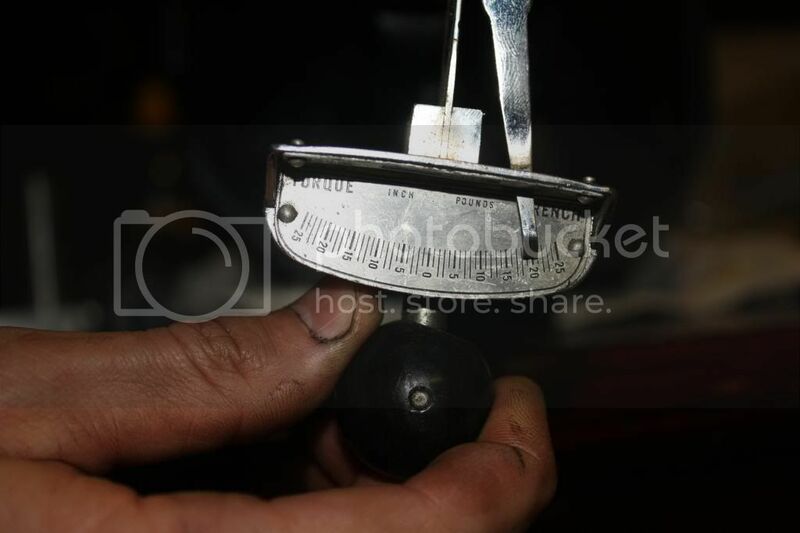 Use either a caliper or a micrometer to determine the thickness of the shims. Ours read the first time somewhere around .071". We removed about .050" - .060" and then went again. 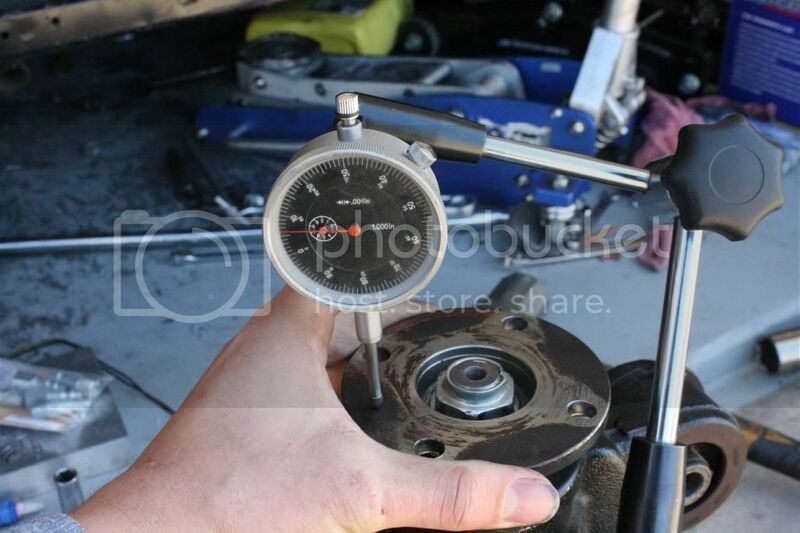 Then once we got down to within .001" - .002" of 0 movement, it was time to measure to preload the pinion bearing. Let's say in theory you had to remove total .070" to get to 0 movement. 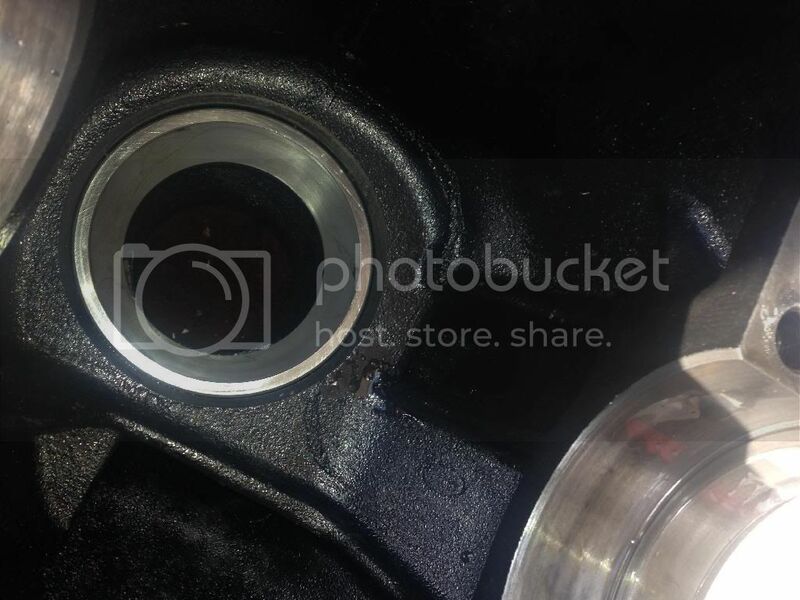 To preload the bearing you want to remove .073" - .074" so you would essentially have negative .003" - .004" of movement in the pinion. This is how you preload the bearing. It is a tedious process and you do need to be exact. It took us a good while before we were content with our measurements and even when we thought we were dead on the first time, we pulled everything apart, remeasured, and reinstalled everything just for peace of mind. 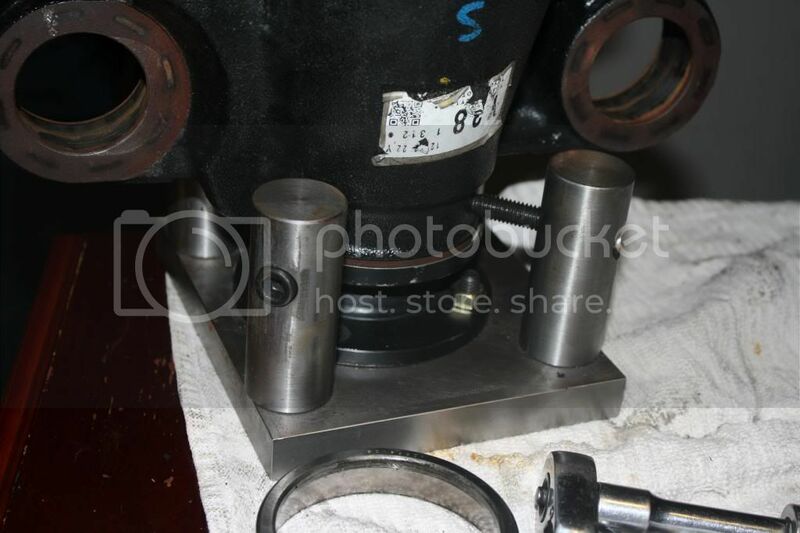 When we got down to the .001" - .002" of movement, we removed .005" of shimming. Now the shims only went down to the smallest being .007". 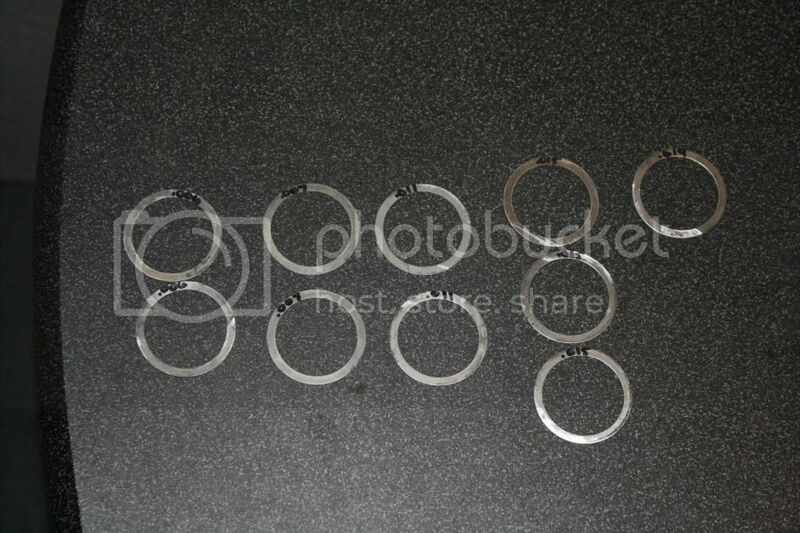 So again we had to stack various shims until we got the correct amount of shimming needed. This is where it is tedious and you want to check and recheck to make sure it is set up correctly. EDIT**** More work was needed. Read further. Well I wasn't content with how it went together the first time. I kept getting small inconsistencies with the calipers I was using, and then I had to do trial and error with picking which shims I would use, measuring their thicknesses, adding, subtracting, yada yada. So I pulled everything back apart and had a second go at it. I knew that I needed approximately .030" of shimming to get to close to 0 movement. 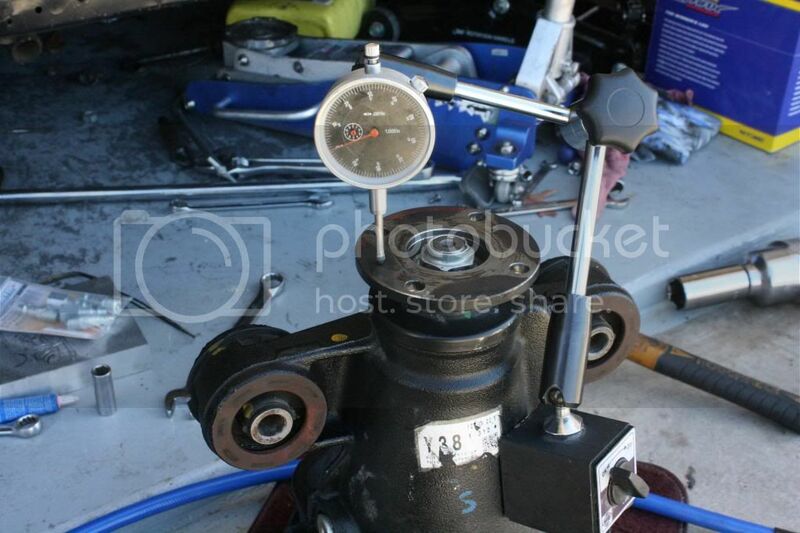 So first thing I did was measure all of the shims using a micrometer instead of the calipers I used before. Then I used a sharpie and wrote the measurements on the shims themselves to make it easier to calculate their total thicknesses. Then I used the .019" and .015" shims I had to get over the approximate .030" of shims that I needed (.019" + .015" = .034"). I measured the pinion movement with the dial indicator. And now that I measured and marked all the shims, it was a easy as pie to get the correct total thickness of shims needed to set the pinion and preload the bearing. After that it all went together like before and this time it was much easier and more exact. In fact it was so easy my 6 year old could do it. *WARNING* Use 6 year olds at your own risk. EDIT*** More work was needed. Read further. The last way to check to make sure everything went together as it is supposed to is to use a beams style in/lb torque wrench. 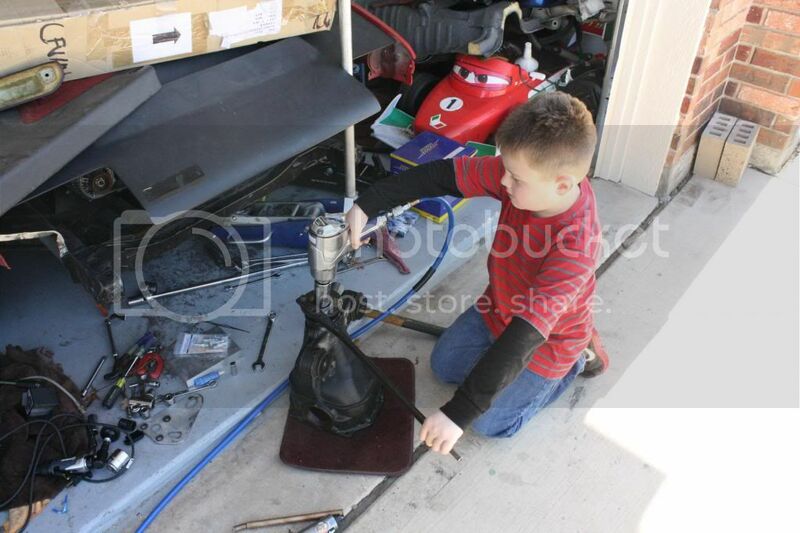 Put on one of the drive shaft bolts and use the torque wrench to turn the pinion. 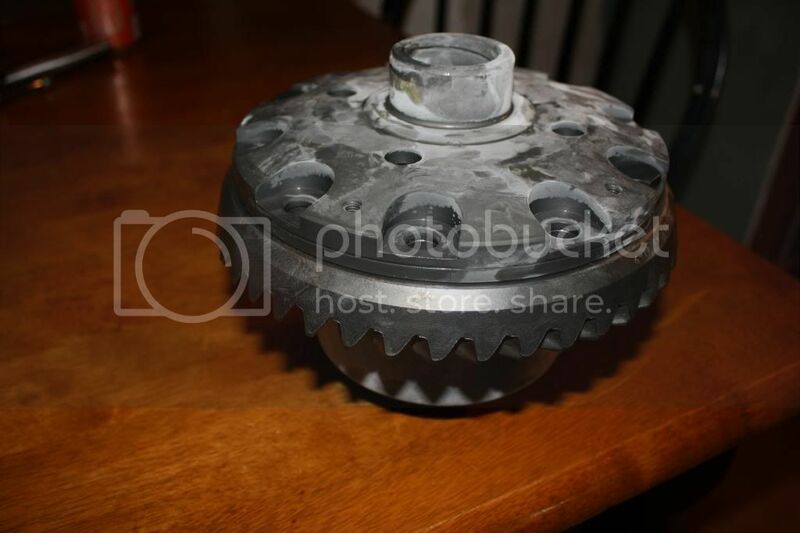 It should take between 9.8 - 16.9 in/lbs of force to turn the pinion. I will be doing this on Monday as a final check. 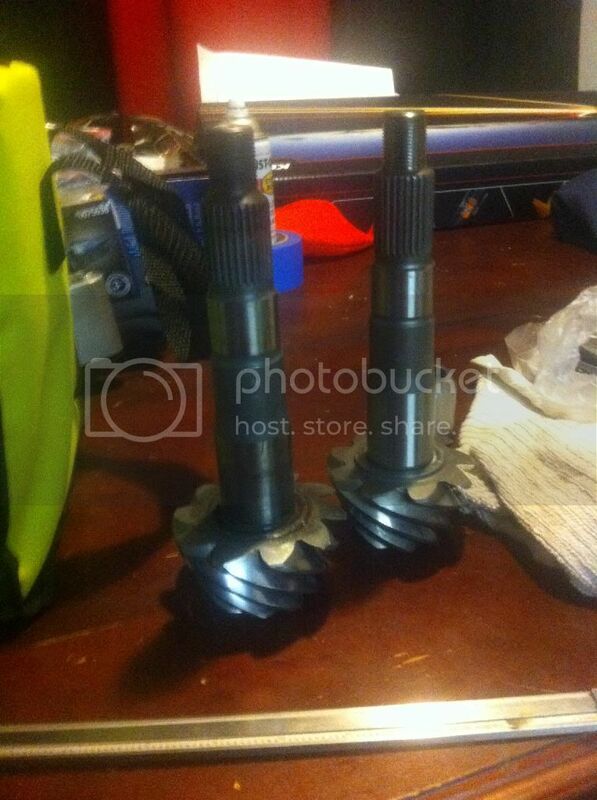 Finally got the pinion set and the pinion bearing preloaded. 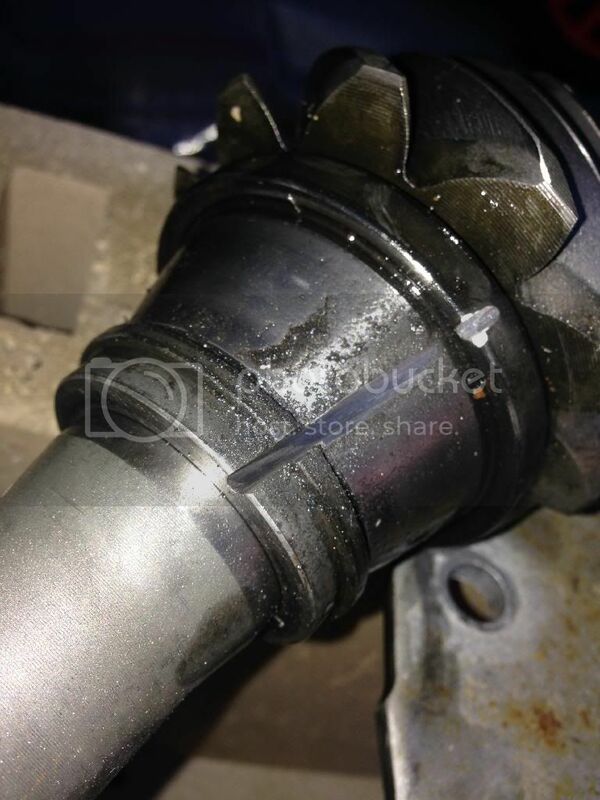 This is why it is important to check the bearing preload with an in/lb torque wrench. I went by the instruction provided about how much shims to remove to preload the bearing. Ended up not even registering on the torque wrench when we checked. Not even 1"/lb. 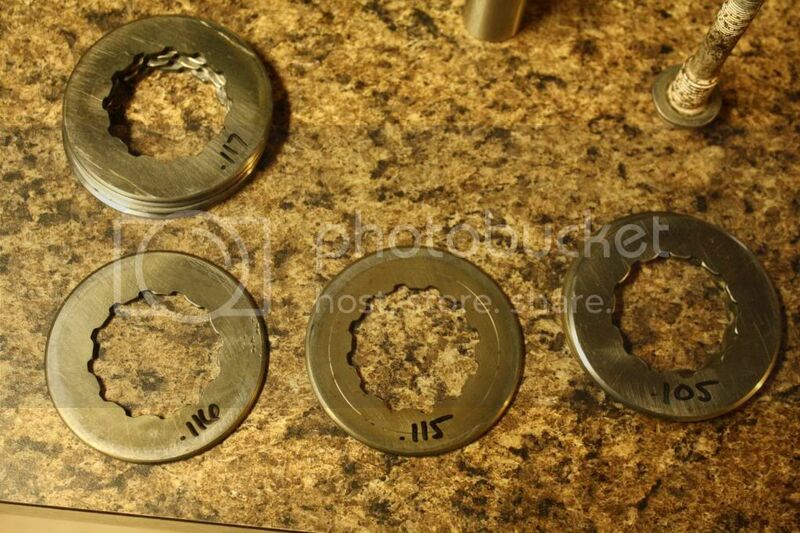 so my brother ended up removing an extra .004 worth of shims to get to the TSM recommended 9.8 - 16.9 in/lbs. 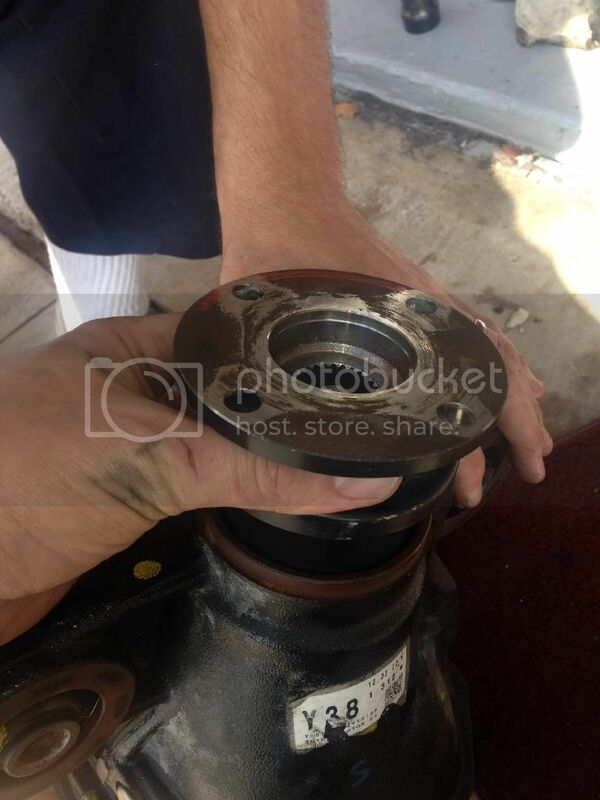 So after getting to 0 pinion movement we removed a total of .008" worth of shims to preload the bearing. 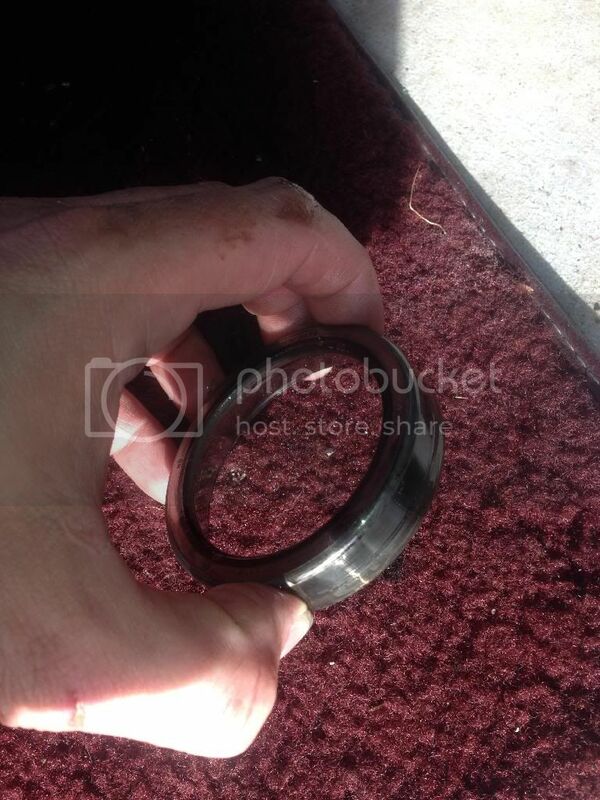 After everything was set, I removed there pinion nut one last time and I installed the pinion seal. 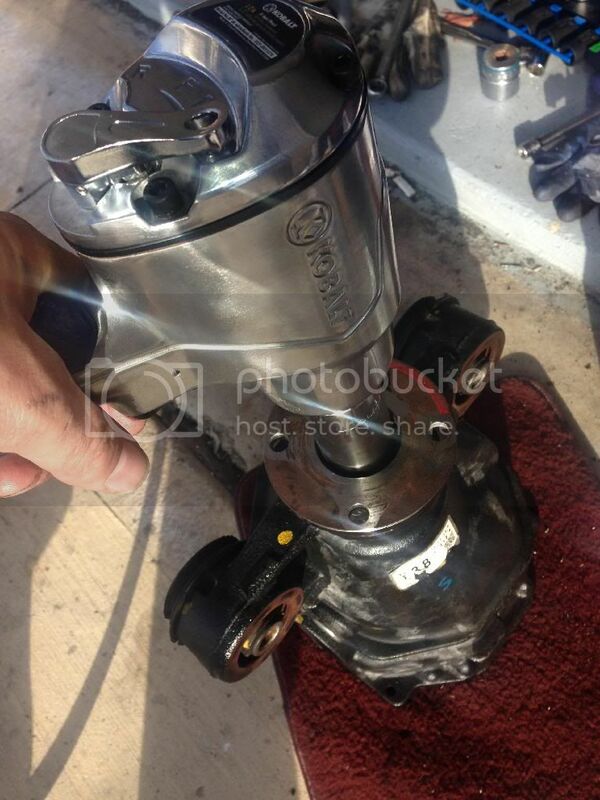 Backlash is set on the differential. 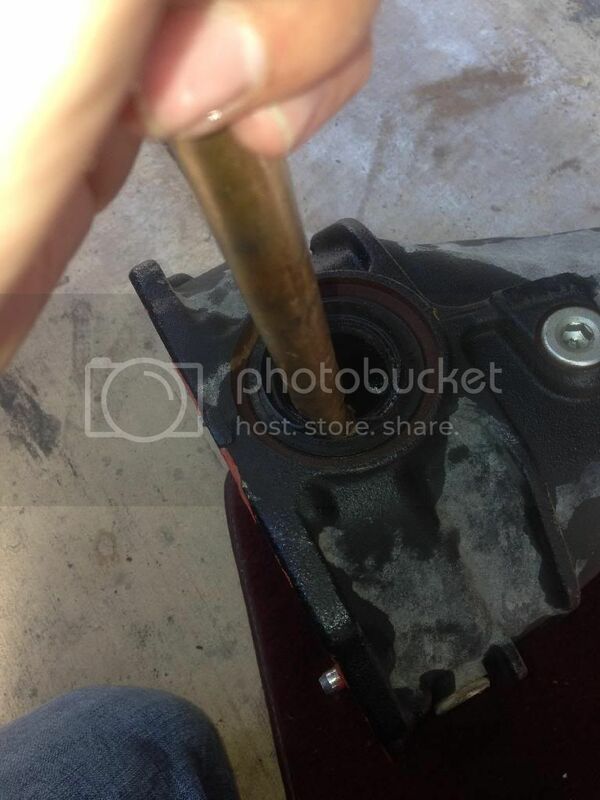 It's somewhat the same as setting the preload on the pinion bearing only this time you use only 2 shims. I measured the shims that came off the factory setup and they measured a total of .227", one being .113" and the other being .114". I did try using those 2 first but they did not work. There was no movement in the differential. So whenever I chose 1 shim to use as a "test" shim to measure the back lash, I just made sure that the other one made up the difference to equal .227". I hope that makes sense. First things first..............a HUGE thank you to Gordo from JZXProject.com for sending me a bunch of shims for me test what I would need. This literally saved me about $200 because I didn't have to buy every shim from Toyota to only need 2. Then, like before with the shims for the pinion, I measured the thickness of them and wrote them on the shims themselves. I started with one that was quite smaller than the originals, .102" and installed it on the ring gear side. 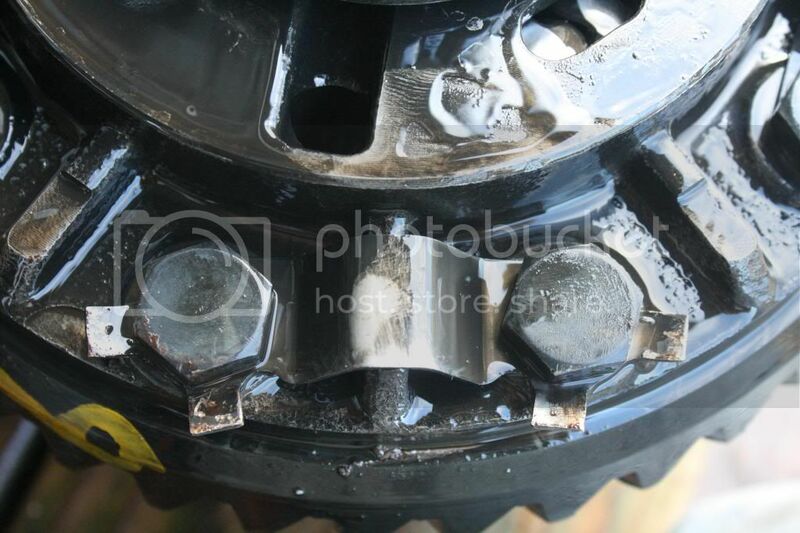 This created less contact with the pinion gear and allowed movement. I didn't get a picture of installing the other one but it was .125" and I had to use the brass rod and the hammer to tap it into place. 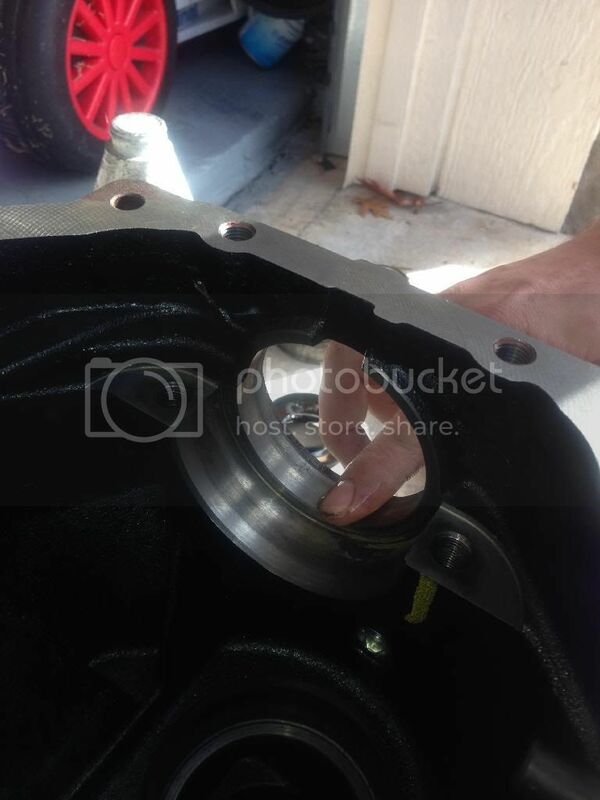 After this you reinstall the bearing caps, making sure to install them on the correct sides. Just snug them down, as you will probably have to test a few different shims before you get backlash set correctly. I did 2 more times after the initial install. 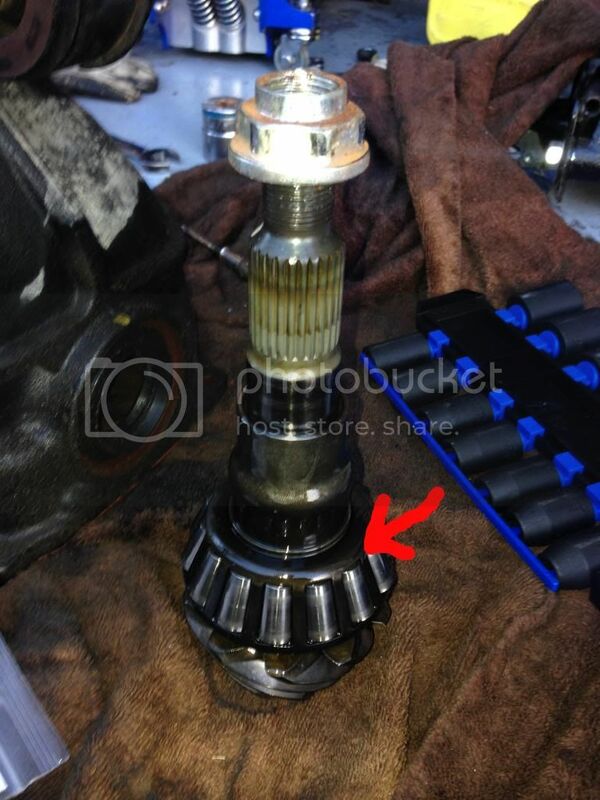 You need to make sure that the pinion won't spin when your twist the differential to check the backlash. My brother made a JIG for his 7.5" rear end. 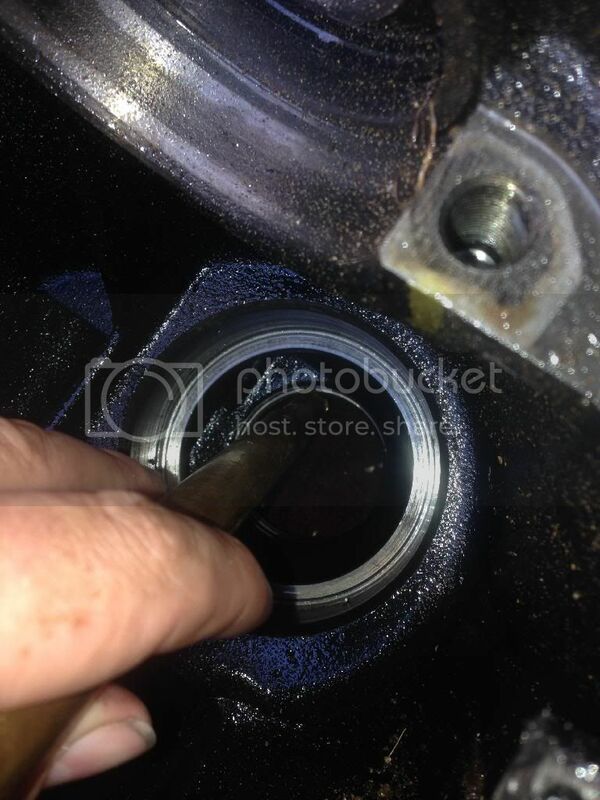 However the holes for the driveshafts don't line up, so I was only able to use 1 bolt hole but it still worked. The carrier bolts down to the JIG and then there are four posts with bolts going through them horizontally to hold the carrier and keep it from spinning. 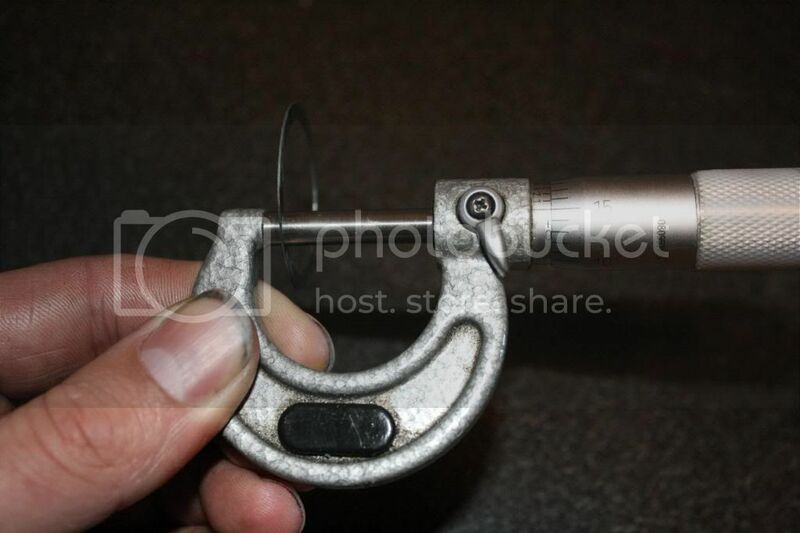 Then set the dial indicator on one of the teeth of the ring gear. Move the differential and check how much movement is there. In the end you are looking for anywhere between .005" and .007" of movement. I got .006". I couldn't ask for better. After that torque the bearing caps down to 63 ft/lbs. I then marked the tooth that I measured. I did this and then turned the pinion until the ring gear turned about a quarter of the way around, set up the dial indicator, and checked again. I did this until all four quarters were checked to make sure everything was within spec. It was. 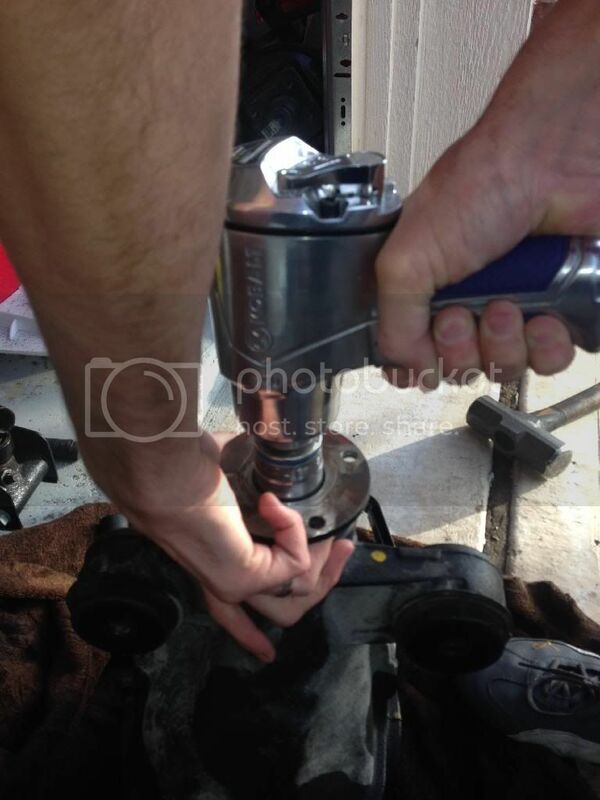 After all is said and done, the final check is with the in./lbs torque wrench. Turn the nut on the pinion and check the dial. It should read between 14.2 - 23.8 in./lbs. Finished installing everything today. I'll upload the last few pics later. My brother put the new axle seals in for me yesterday. I started with putting the diff cover on. 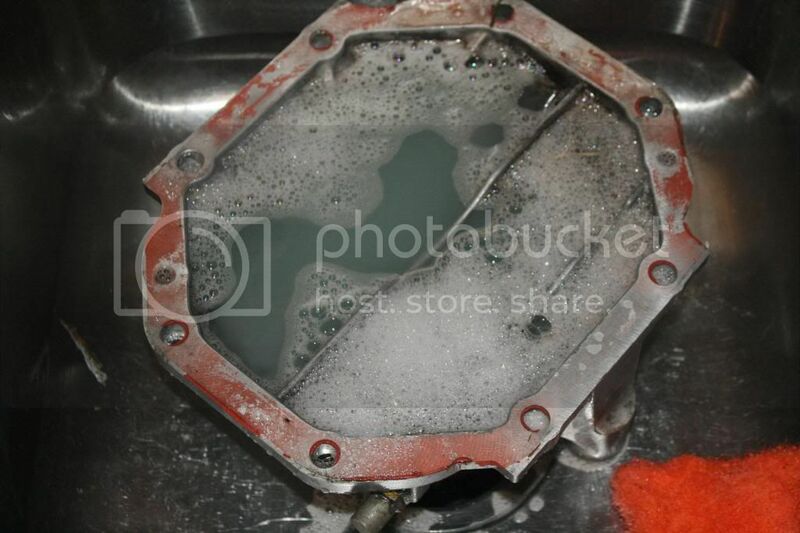 I cleaned the cover the same as I did the carrier making sure to remove all the old gasket material. Using a tube of FIPG (Toyota's silicone gasket material) I applied a bead of the sealant around the perimeter of the carrier. Then I torqued the eight 14mm bolts down to 35 ft/lbs. I then used a floor jack to raise the carrier up. You have to maneuver it around to get the axles in place. It is a little tricky but it can be done. Remember I did all of this without touching anything on the suspension. Then line up one bolt at at time and get a couple of threads started. 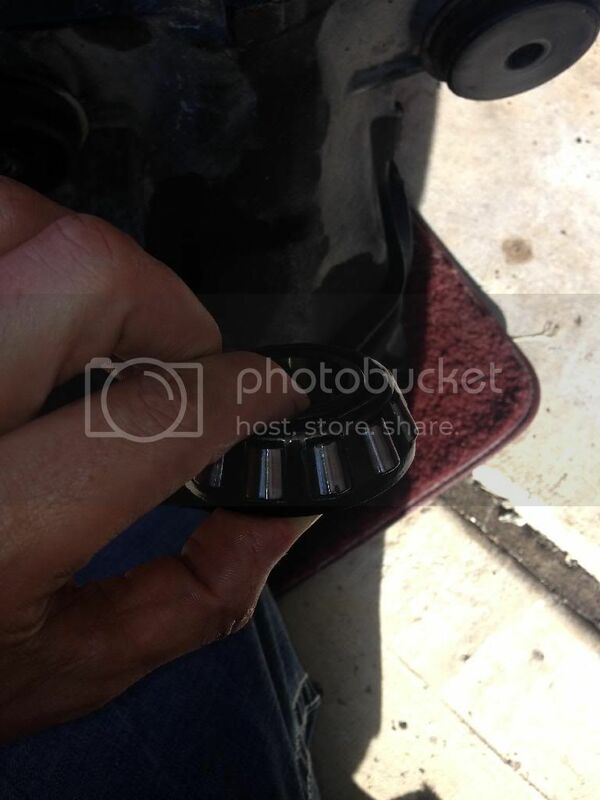 Do this with the all 5 bolts that bolt the carrier up. Once you have all of them partially threaded, you can tighten them up all the way. 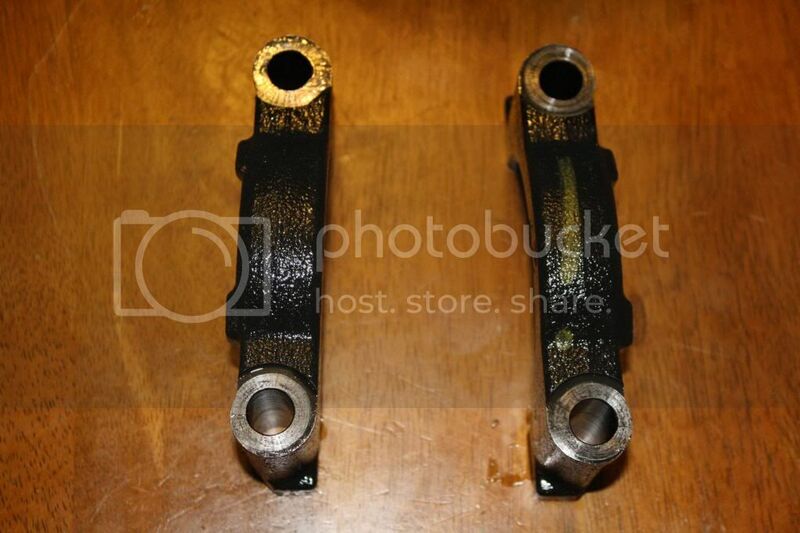 The two 19mm bolts that bolt the carrier to the chassis need to be torqued to 70 ft/lbs. 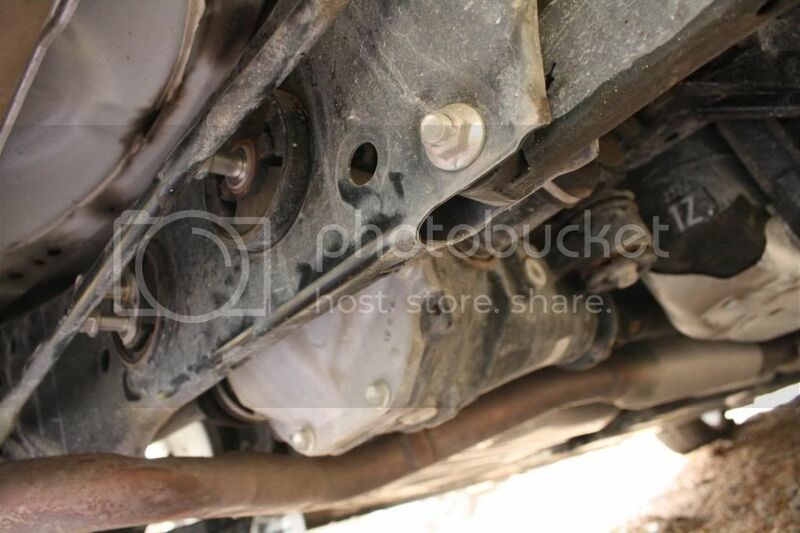 The three 17mm bolts that bolt the carrier to the subframe need to be torqued to 46 ft/lbs. Then the driveshaft needs to be bolted up. 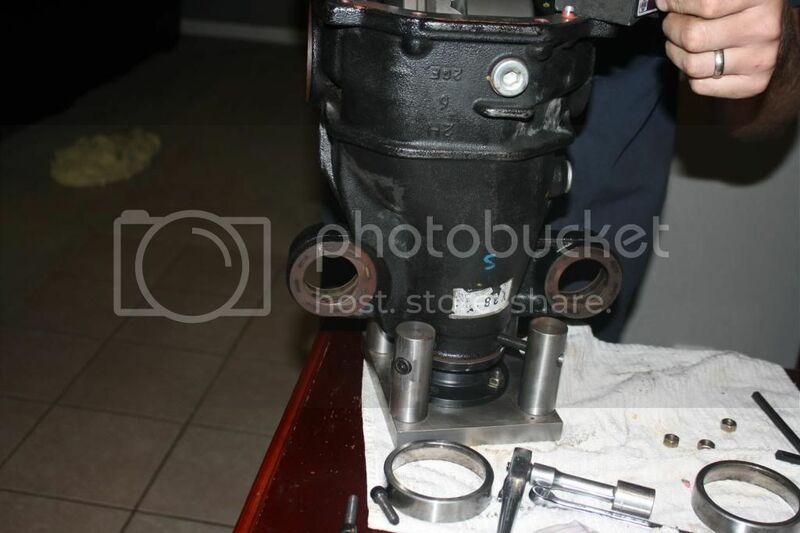 Start with the bracket that holds the driveshaft up in the center. The two 14mm bolts need to be torqued to 38 ft/lbs. 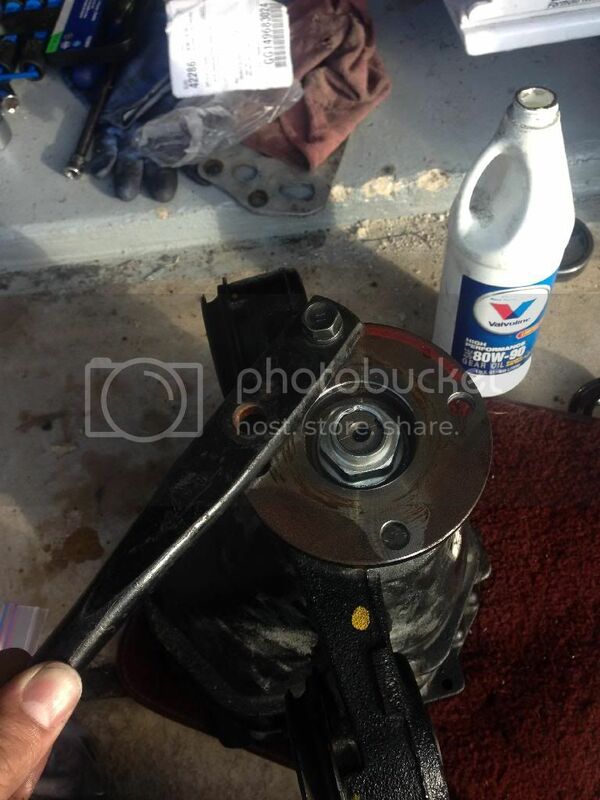 Then bolt the driveshaft to the pinion. The wheels need to be off the ground with the parking brake off or the car needs to be in neutral, I did both. 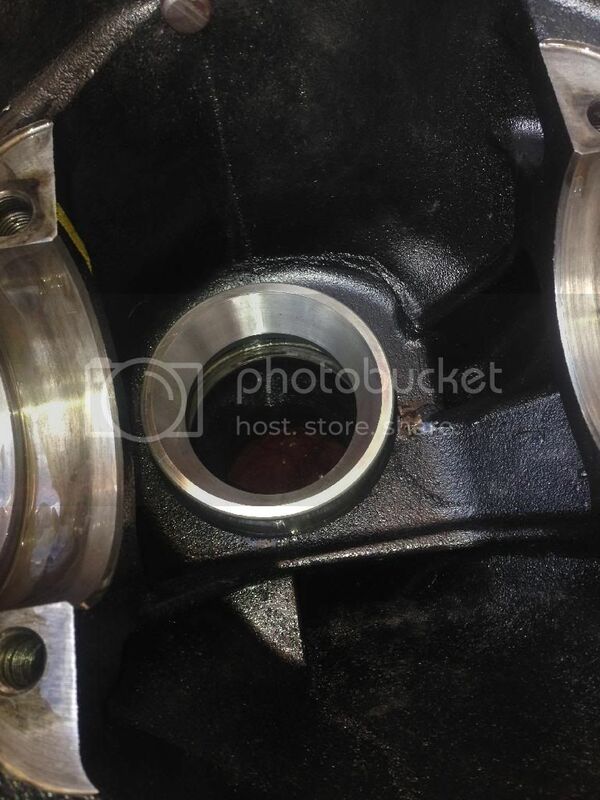 Spin the driveshaft until the bolt holes line up. Install the four 14 mm nuts and bolts and torque them down to 55 ft/lbs. Lastly the axles need to go in all the way. I just used a hammer and tapped on the axle until they went into place. They went fairly easy. Next is adding oil to the rear end. Using a 10mm allen wrench, remove the fill plug on the side of the carrier. I removed the passenger side rear wheel. I then took a funnel that has measurement marks on it and connected it to a 3-4 ft length of hose that went into the fill hole. 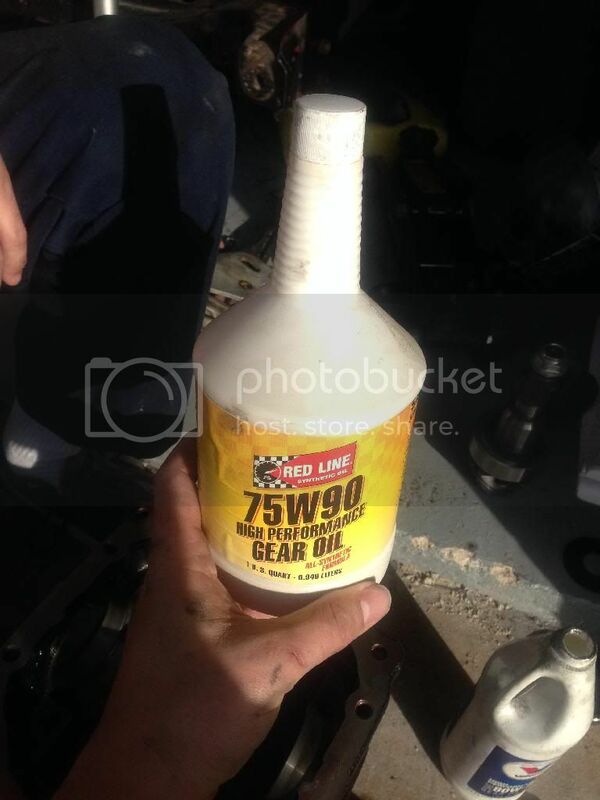 The first oil that you put in does not need to be great gear oil. I used the cheapest 80w90 that I could find. Add 1.3 quarts. Reinstall the fill plug. 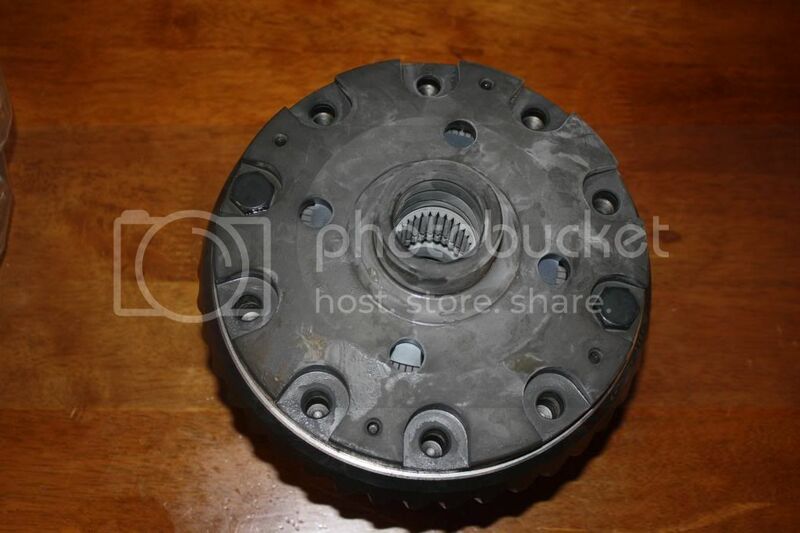 With a clutch type 2 way, the way we've always broke them in is by finding an empty parking lot and go drive in figure 8's for about 45 minutes. It is tedious, but that how it's done. Drive in a straight line, I got up to about 15-20 mph, then push in the clutch, and turn around. After you straighten the wheel, release the clutch accelerate to 15-20 mph, hold in the clutch and turn the other direction. Repeat for 45 minutes. 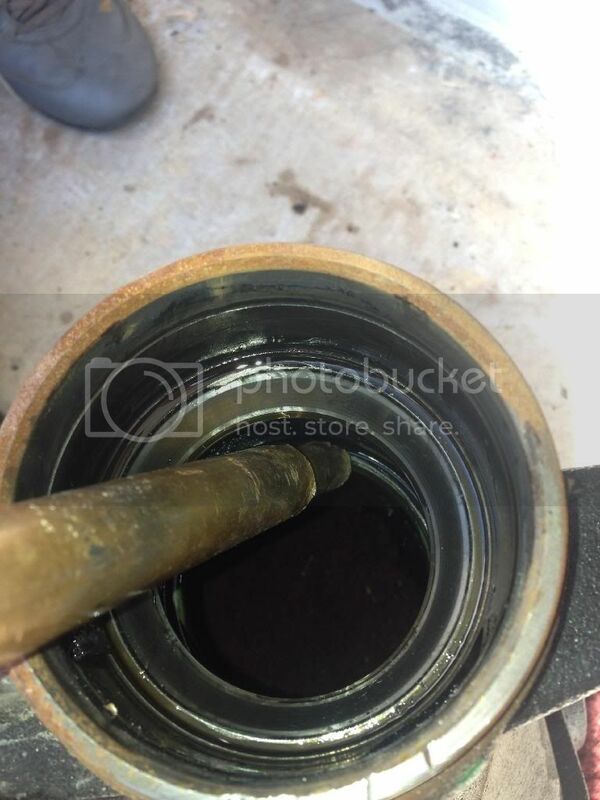 After that, go home, drain the oil, and refill with quality gear oil. 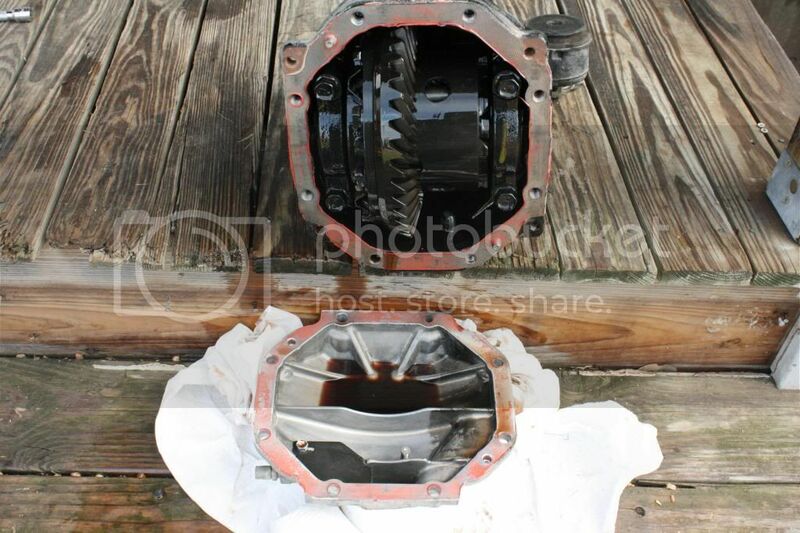 My Tomei differential came with Tomei gear oil that I used. Added 1.3 quarts. DONE!! So far I can't tell you much. The rpms are obviously higher at any given speed compared to before. 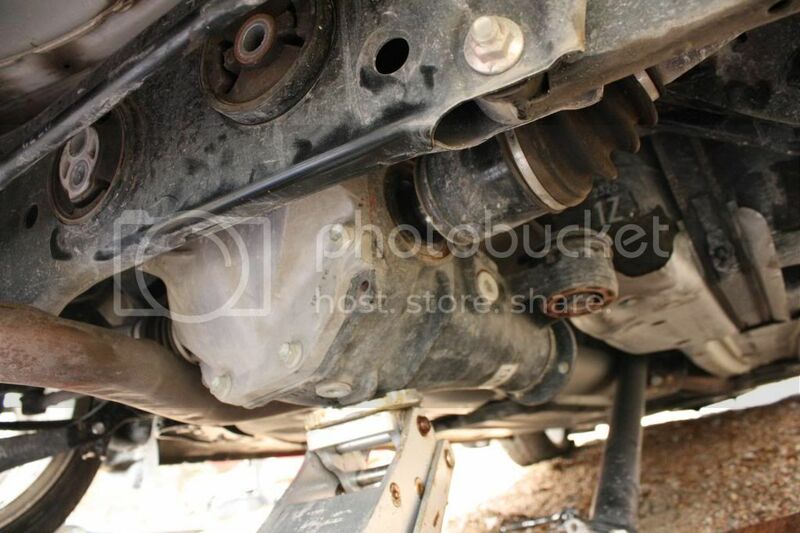 And there is loud "clunking" noise during low speed sharp turns as is to be expected with a clutch type 2 way. I plan on putting a few hundred miles on the car before I really get into it. Stay tuned!!! Last edited by Dustin; 01-29-2014 at 12:18 PM. Now that I've put a couple hundred miles on the set up I figured I'd give my initial thoughts on each piece as best I can. This is on an otherwise stock car performance wise. No tune, no exhaust, no intake, ect. I notice a difference in acceleration mostly in 2nd, 3rd, and 4th gears above 4k RPMs. 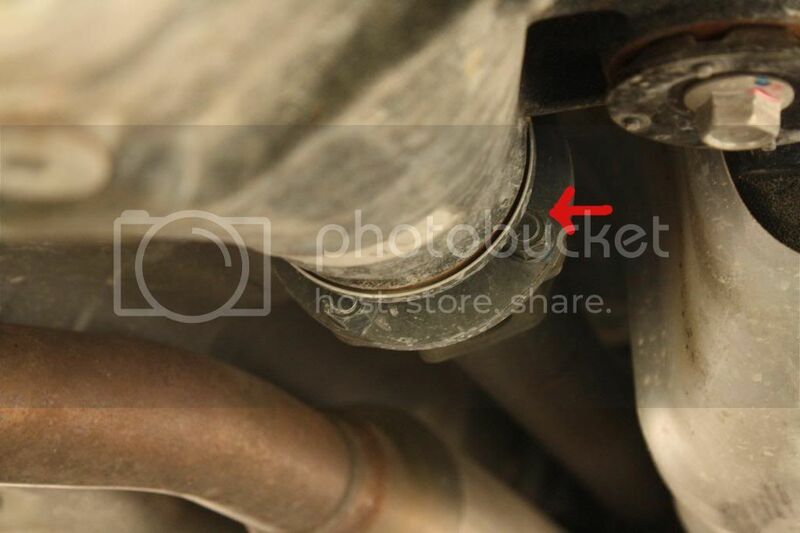 Below that you're still in the dreaded torque dip. I did do a red line pull in 5th gear but the power isn't there for me to "feel" much of a difference. But I don't remember ever doing a 5th gear pull to red line with the factory gearing so there might be a difference but it's still weak sauce with no power upgrades. This is a great upgrade IMO. Initiating tail out action is not only a lot easier, but it is much smoother both entering and exiting a corner. You do hear clunking under slow sharp turns but that is to be expected with a clutch type 2 way. I've also been told that you have to change out the oil in the rear end more frequently. 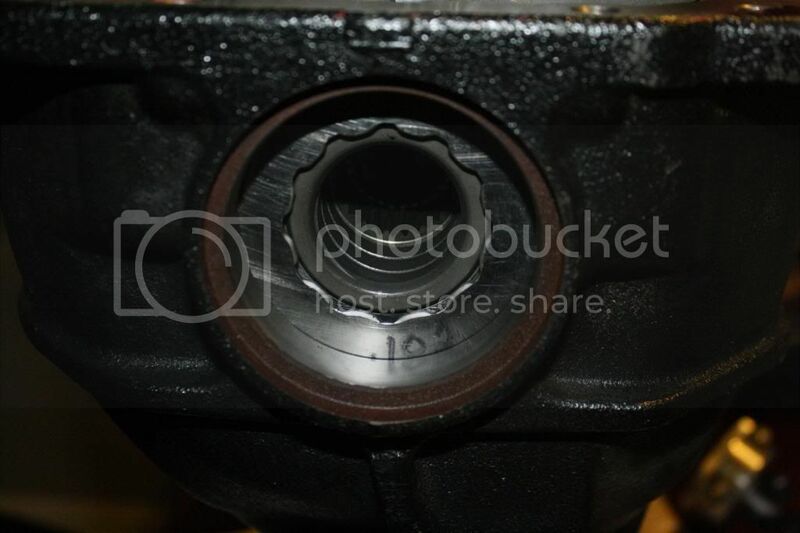 For example my factory rear end had 21k miles on it and I had not changed the oil. From what others have told me with their 2 way LSD's it needs to be changed about every other oil change on the motor. So let's say approx. every 6k to 10k miles. Still worth it IMO. Last edited by Dustin; 01-29-2014 at 12:33 PM. Now that I'm supercharged I thought I'd give my final thoughts. I haven't been to the dyno but if I had to take an educated guess I'd say I'm around the 250hp range give or take a little. The gearing for this setup in my opinion is perfect. It doesn't seem "too short" and I don't feel I have to change gears too quickly. It pulls very well all the way through 5th gear and pulls decent through 6th. I have no doubts that I could hit the rev limiter in 6th gear with a long enough straight. I don't see myself ever getting much above the 130mph mark and that'll be what you'd be hitting in the higher rpms of 6th gear. 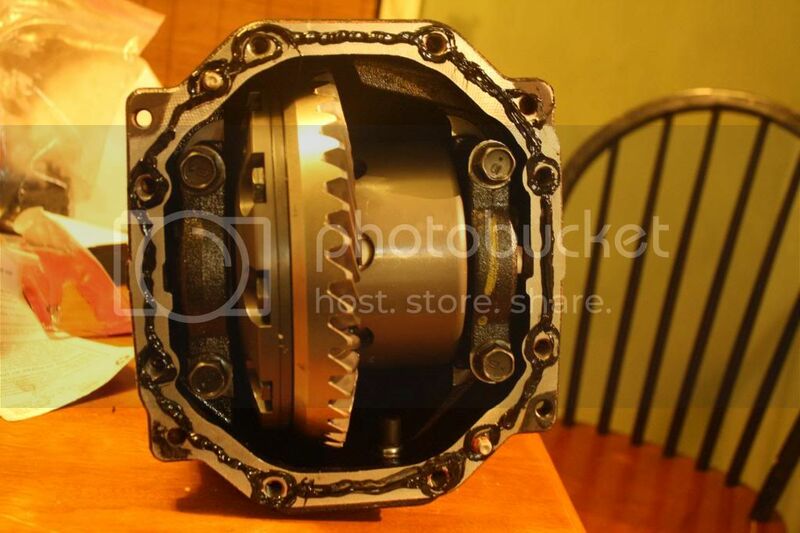 So unless you're going for a top speed drag car, this gearing is a solid upgrade. I'm about to get an E85 map which should get me closer to the 300hp range and I think that would be the max I would want to run with this gearing but time will tell. Later on down the road I will probably get the bug for more power and will go bigger and better and I'll see how I feel about the shorter gearing then. Getting the tail end to slide out when I want it to is a breeze and still very manageable. This is a great upgrade for those who want to keep their car in the lower HP range (sub 300) and I would say it is a great improvement especially if you're staying NA. Enjoy. Last edited by Dustin; 05-21-2014 at 10:31 PM. 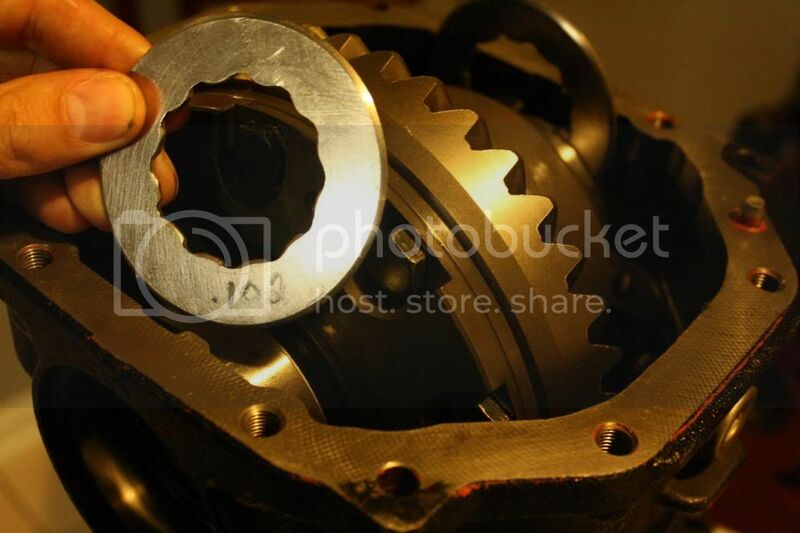 nice thread, I dont have plans to swap gears but I still want to see how this DIY goes. Thank you sir. I have been watching your build and I am very impressed. I respect someone who does their own work. This will take me a week or two because I am working on it in my spare time and with Christmas in a couple of days, my schedule is pretty full. I will finish though and give my after thoughts. This is awesome! Thanks for taking the time to take pictures and write detailed instructions. I won't be installing mine myself, but this should help if a local friend mechanic can do it. I can't wait to get this done! Last edited by mike_ekim1024; 12-22-2013 at 02:53 AM. I can't wait do get this done! My pleasure. 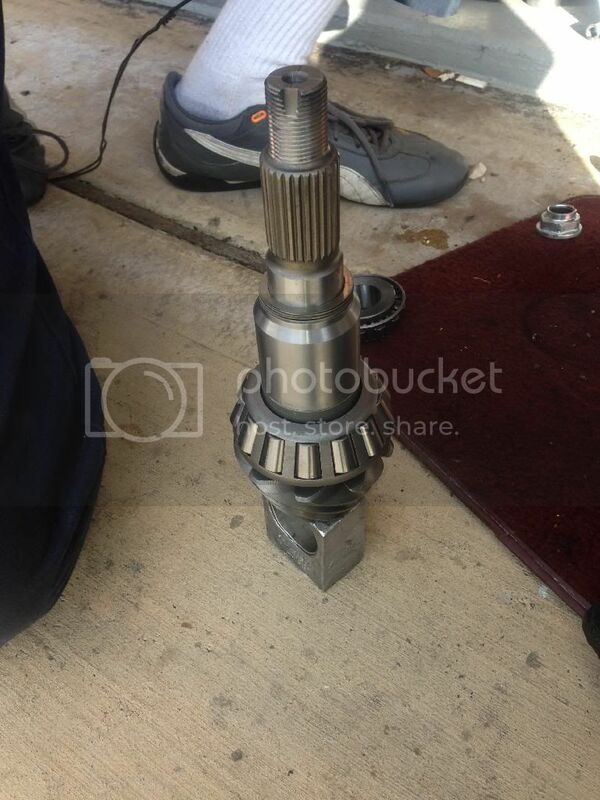 The hard part from what I've been told is setting the pinion. I'll make sure to document well the parts that aren't simple unbolting and bolting. What diff are you going with.. sorry if I missed it.. Edit: saw Tomei... What are you going to be doing with the car??? and why Tomei??? What are you going to be doing with the car??? Cost mainly. I found one brand new for $795. Couldn't pass that up. Normally they were around the $1000 mark with the cheapest I found before the $795 was around the $880 - $890 mark. My friend has a Kaaz 2 way in his S14 and my brother has a Cucso 2 way in his AE86. Figured I'd try something new. Updated first post!! More to come!! My brother was a nice guy and finished some of the work for me. Updated the first post again. 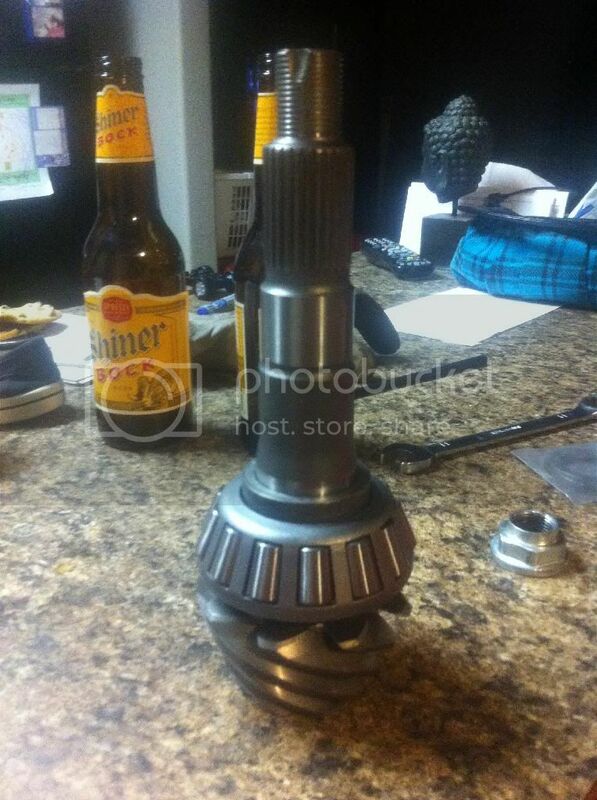 Got the new pinion in and set the preload on the pinion bearing. I'll post some pics later and detail the steps taken. I have nothing to add to this except to say I like your choice of beer, sir. Thanks much for this thread. Been wanting to do this mod for a while and thinking about doing the work myself.